Alexandra, the town not the daughter! Probably the flashest toilets so far seen. Right in the centre of the town with easy access. and the door control system. 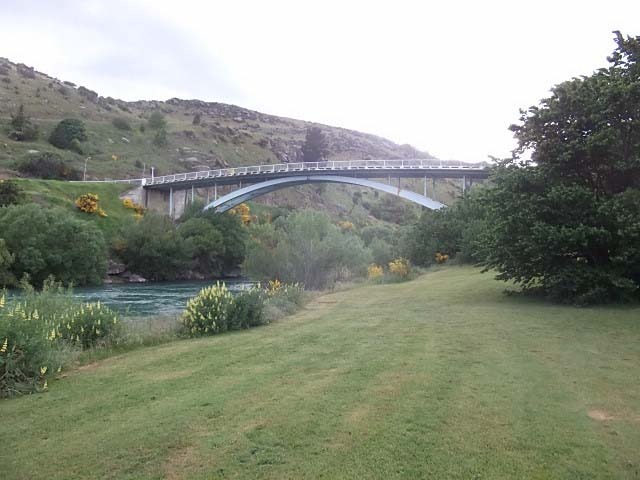 There have been three bridges across the river at Roxburgh. The first was washed away in the late 1880s when the Clyde bridge made its way down the river in a huge flood taking three lower bridges with it. 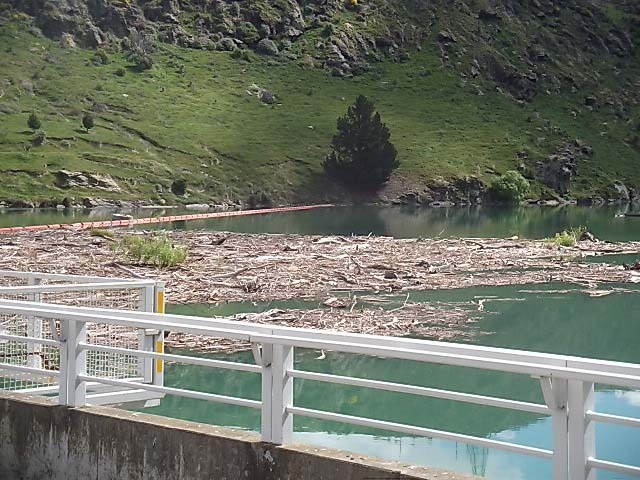 Top of the Roxburgh dam, and debris caught up in the boom. 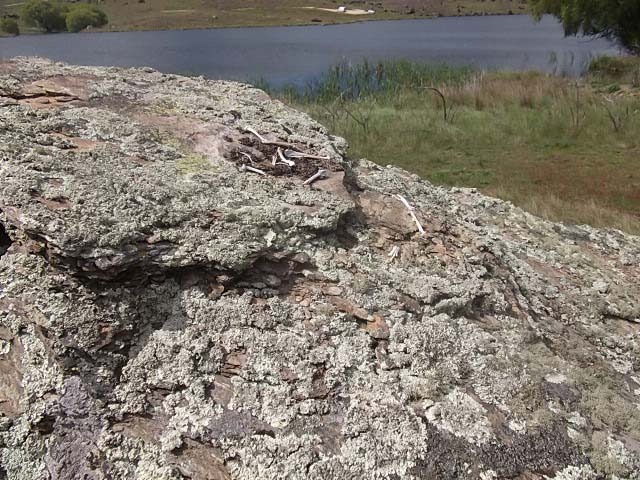 Then back onto the main road travelling through some stunning country before coming across Butchers Dam, just a few kms out of Alexandra. parking spot at Butchers Dam, surrounded by Thyme. 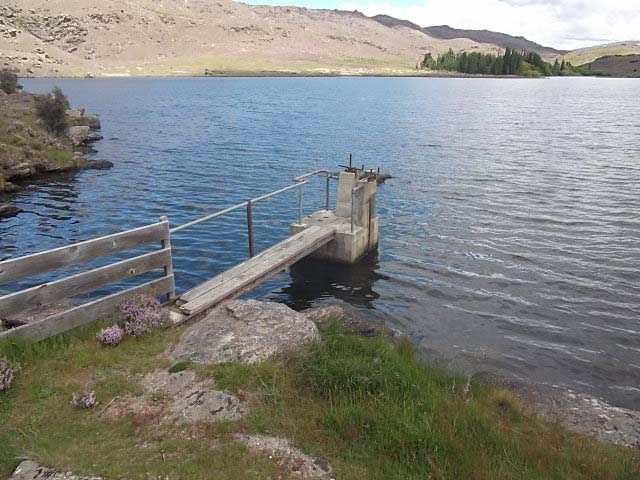 We headed down to the waters edge and decided to park up here for a day or two where we can watch the fish jumping, enjoy the sunshine and relax….oh yes, isn’t that what we do best? and this is the view out of the door of the van. 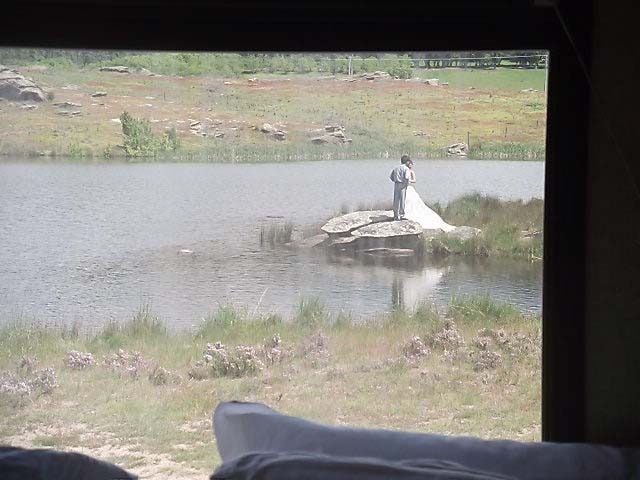 and this was the view out of the back window, a Japanese couple having their wedding photos taken! The RAV was unhitched so we could go exploring, first stop was to Mitchells Cottage, Fruitlands. 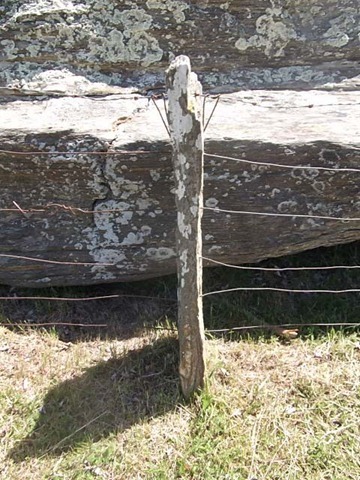 Here we came across the most unusual fence posts seen around the country. 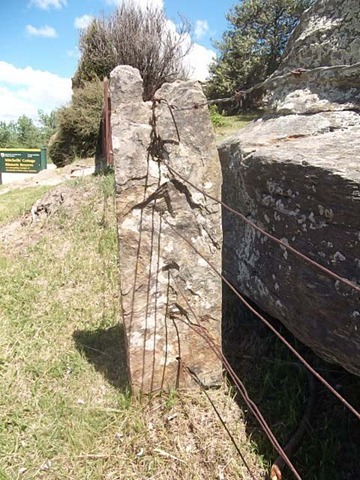 Hewn out of the local stone these have been in place for the past 100 years. 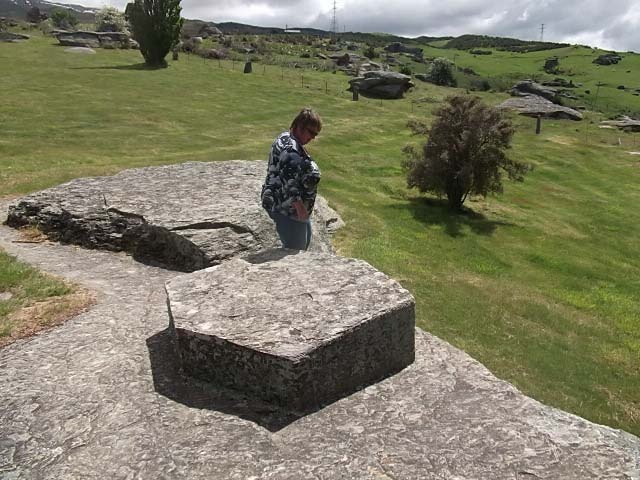 Bernice admires the handiwork of the original settlers who created this flat surface to act as the base of a sundial. Unfortunately the gnomon and hour markings are long gone. 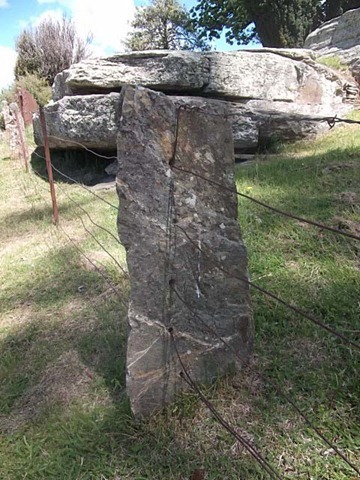 Signs of drilling in the rocks near the house show where stone has been quarried for the house and surrounding buildings. 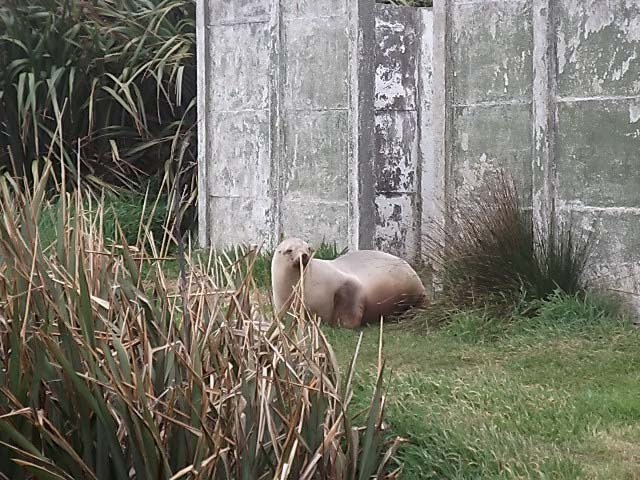 On Tuesday we made our way back to Oamaru, where we are now stationary for a while. Left Waikawa this morning heading toward Papatowai. 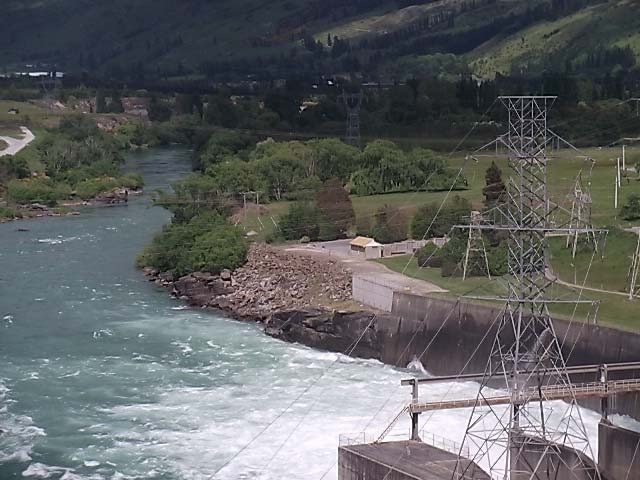 Decided that we needed to head toward Balclutha to see about repairs to the stabilisers as we are unable to extend the slide-out without a stable platform. 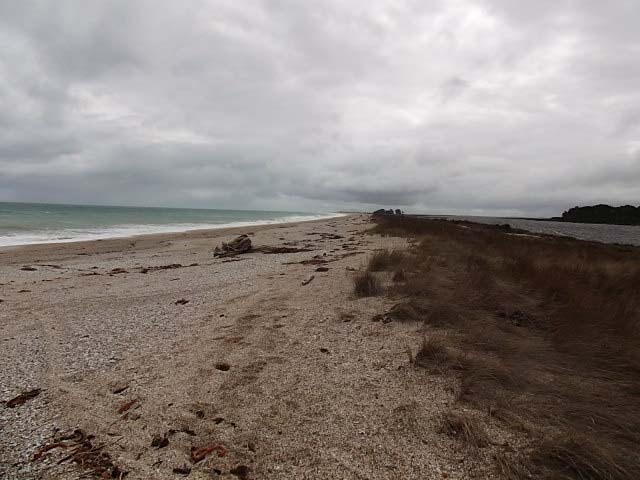 Before we got there we were going to look at Tautuku Beach as a possible stopping point. However we flagged it as the book said it was a narrow drive in and it did not show a symbol for large vehicles. We did get a good sight of the beach further along and now wished we had perhaps unhooked and explored. 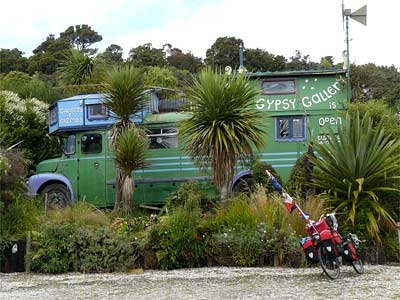 Look at The Gypsy Bus and Moving Sculpture in particular. 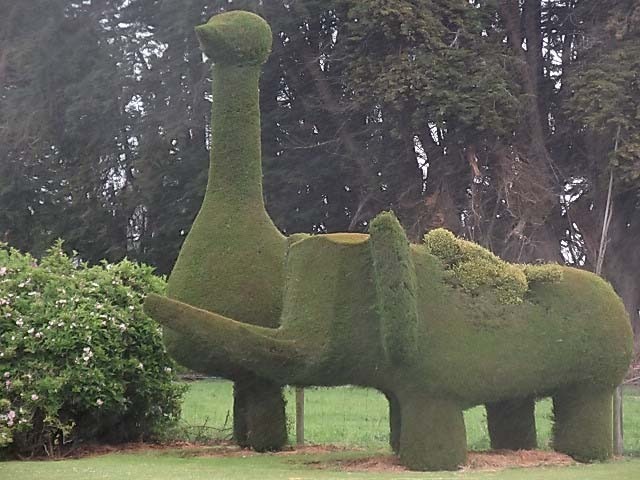 It is definitely worth a visit for anyone travelling past. 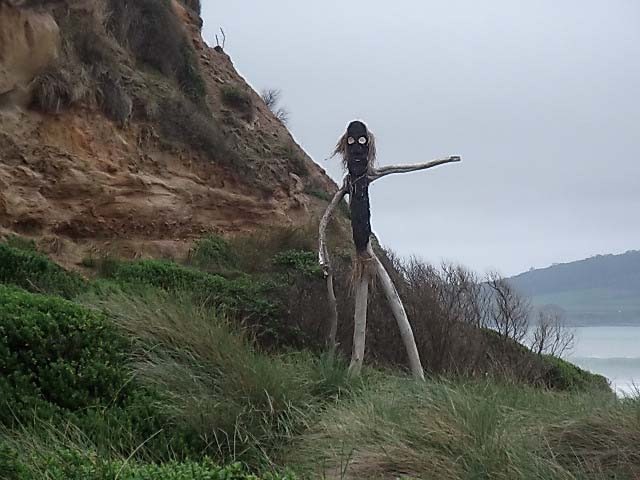 The location is easily recognisable from this character standing on the side of the road. 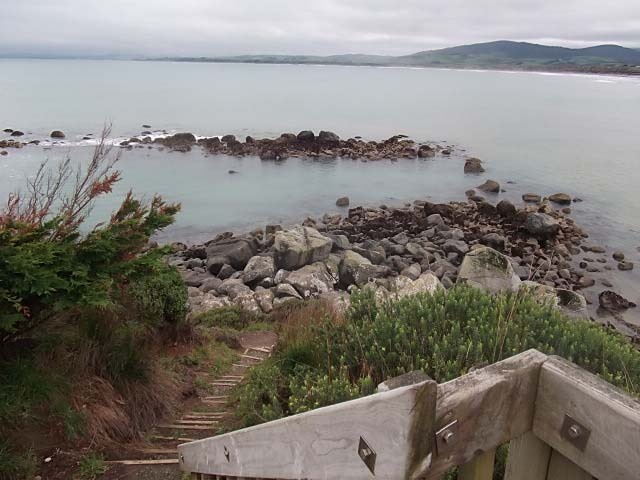 So continued across the bridge to McLennan and then decided to have a look at Purakaunui Beach. 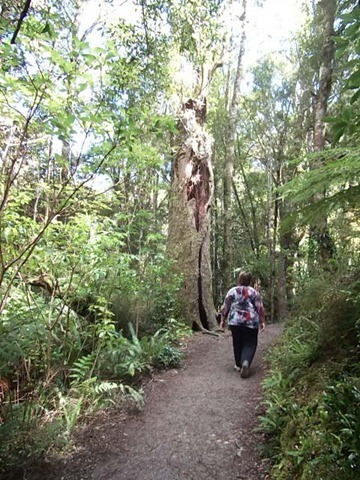 On the way we decided to visit the Purakaunui Falls. This involved parking the van at McLennan unhooking the car and driving off into the wilderness, well it felt like that. 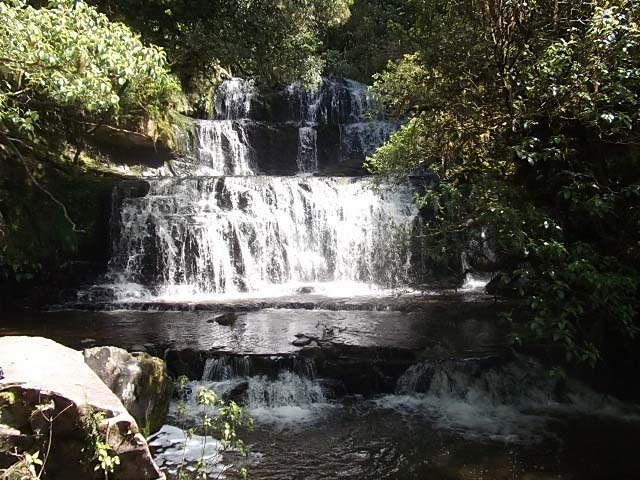 We arrived at the spot and then had a walk in the bush to the falls. On the way we spotted these falls which shamed the Niagara Falls previously mentioned near Waikawa. 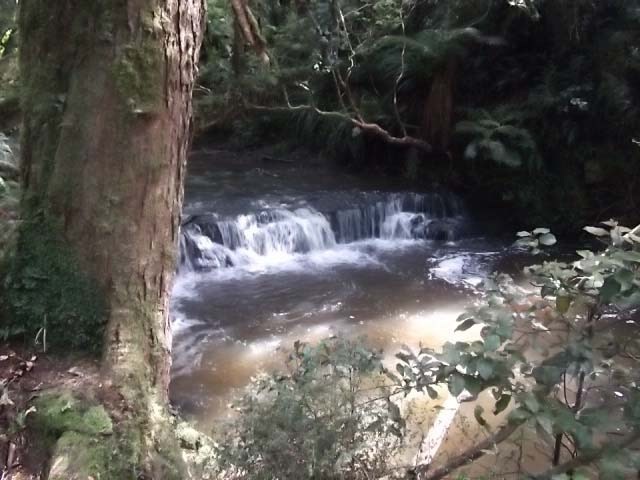 However further on we did come to the Purakaunui Falls. On the way back came across this tree. 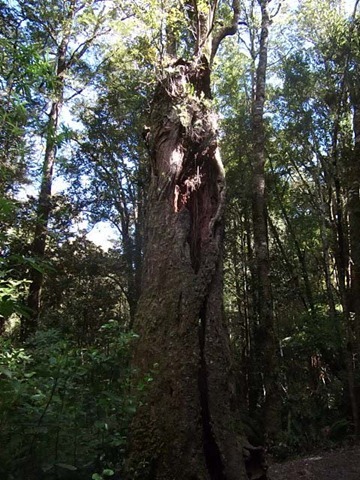 The trunk at the lower level is completely hollow, but there must be enough left for it to support the growth of the quite large trunk above the splits. Back to McLennan by a different and faster route and decided to continue on to Owaka. 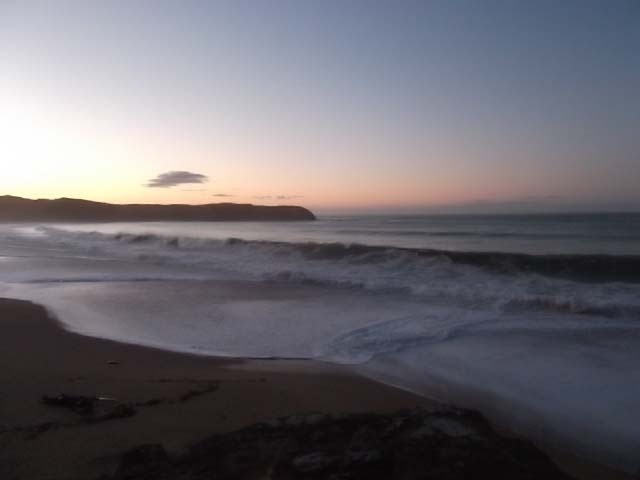 We thought of camping at Jacks Bay as we had been told it was a good spot. 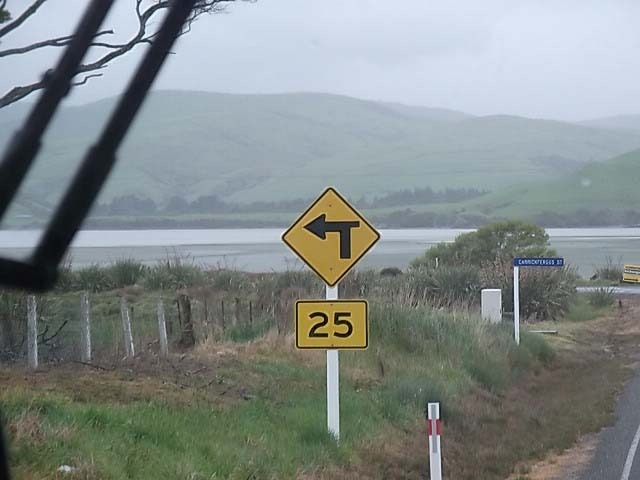 On the map it showed that there was a bridge between the road to Jacks Bay and Pounawea which would provide a short cut back to Owaka. Drove out to Jacks Bay but there was only a small parking area suitable for shorter vehicles than ours and it was occupied. 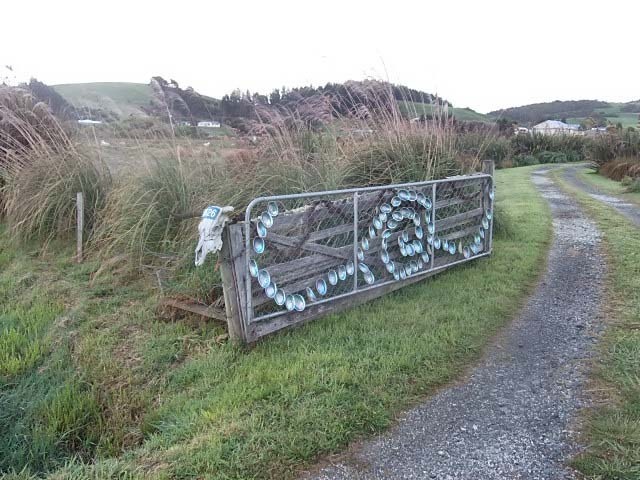 So across the bridge to Pounawea. But no, the bridge had a weight restriction, we would have been 150% of the allowable weight, so instead of an easy 6km to Owaka it turned into a 14km trip. Live and learn. Nothing at Owaka so looked at two possible sites, an LCP (Low Cost Parking) and a POP (Park over Place) between there and Balclutha. Set out according to the book and ended up at the intersection for the LCP without having seen hide nor hair of the POP. 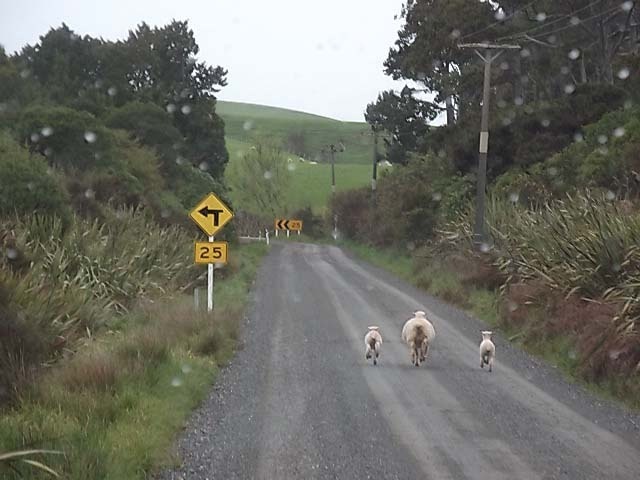 So off to Ahuriri Flat Road and LCP 2217 where we found very hospitable host. The wind was extremely strong but we managed to park on the grass, and proceeded to settle in. The owner, Kevin, popped his head through the door to give us some free range eggs and to invite us along for happy hour. During the ensuing conversation, Kevin mentioned that he built motorhomes, and it came up that we were heading toward civilisation to get the hydraulic jacks seen to. 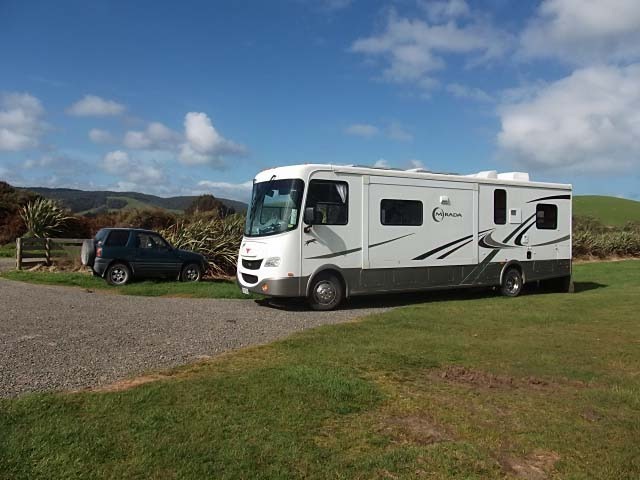 He offered to have a look, managed to get them to work briefly and came to the conclusion is was an electrical problem and that tomorrow morning we could follow him into Balclutha where he knew we could get it looked at. Sorted. We then settled in for a few drinks over a very few happy hours! The bottles of good wine kept appearing and it seemed very rude to refuse a “try this one, its very good”! We managed to weave our way back to the van, I think we had dinner, and then crashed into bed. Boy, are we ever out of practise! 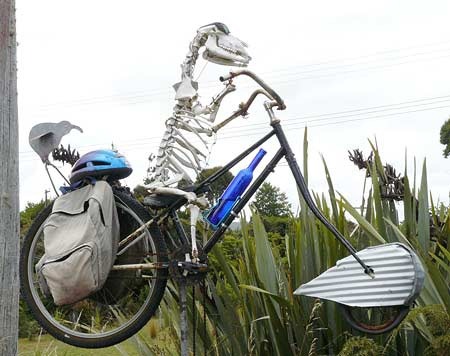 Up early and off into Balclutha to the electrical shop where we found a couple of helpful chaps. 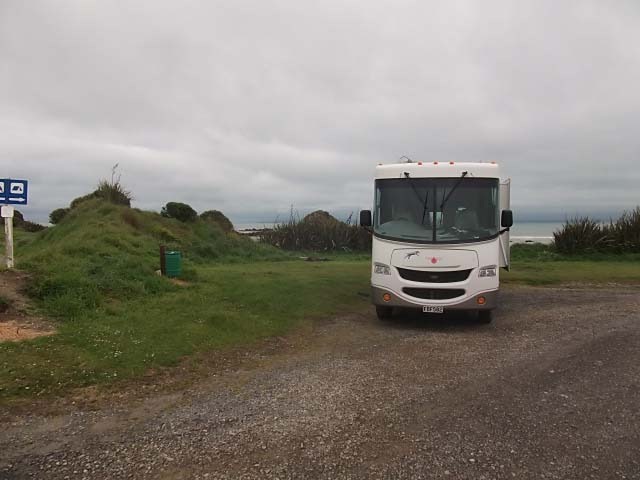 We left the van with them whilst we went off to attend to chores and check out the free wifi accessible all along the main street – thanx Balclutha Township. The van was duly sorted by lunch time, what we thought was going to be a long and involved and expensive fix turned out to be reasonably simple. 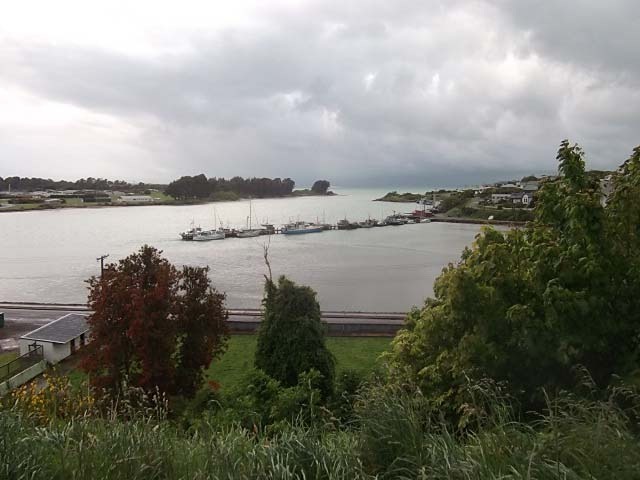 It was drizzling steadily by now so we decided to stay in Balclutha for the night at the Town & Country Club. 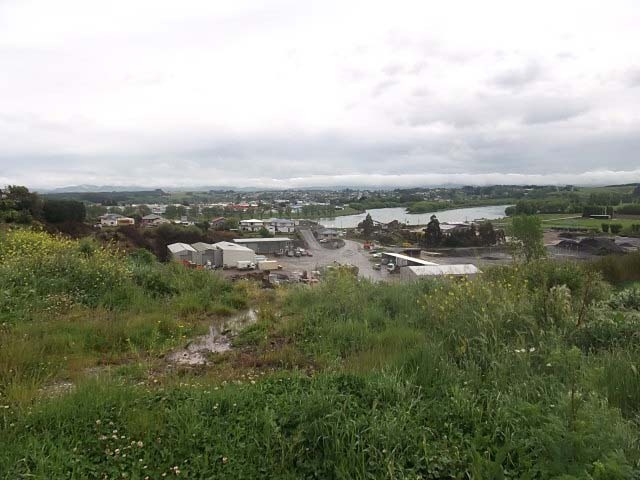 Looking out over Balclutha from our parking spot. At the end of today Roy told Bernice “we have travelled far too far and in one day”! 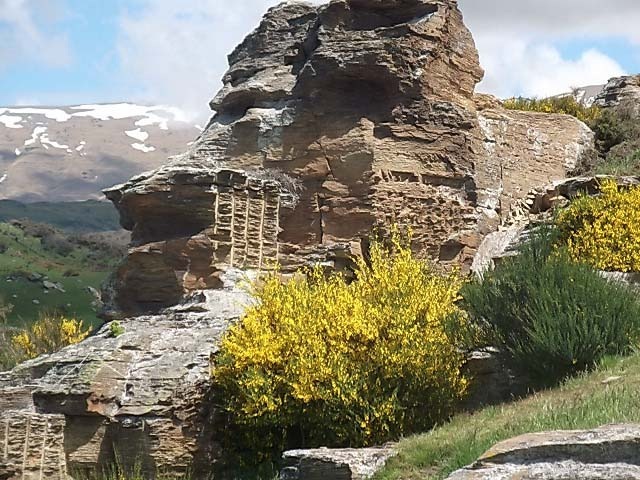 Yes, we went the huge distance of 114kms from Balclutha to Roxburgh. Bernice reminded Roy that on this particular day one year ago, we travelled 405kms from Loana to Nimes – THAT was a long way to travel in one day! 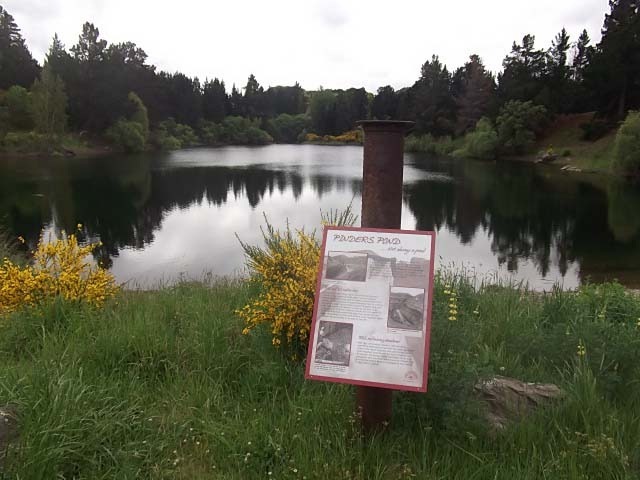 Along our travels today we headed through the Manuka Gorge – a Gorge we have long heard about from Mike & Ann as they were warned of this “difficult” Gorge to travel through when they first moved to Dunedin. 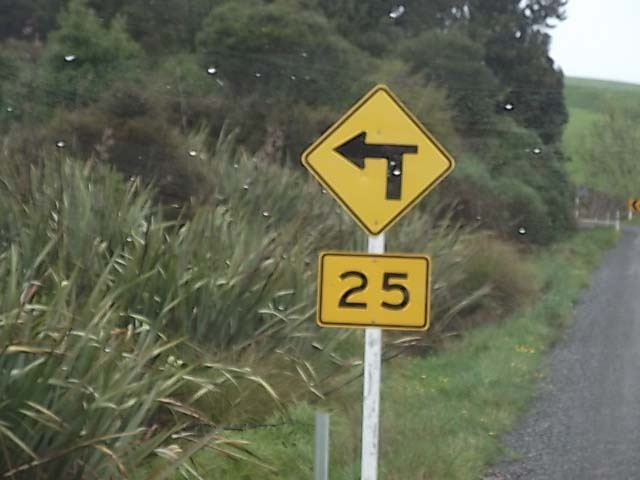 Now we understand the mirth this caused – there is nothing difficult about the road at all, we have driven the van through the Karangahake Gorge now THAT is a Gorge. 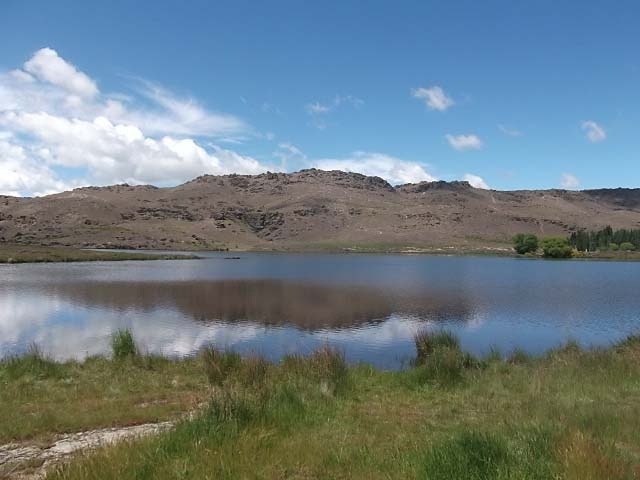 Stopped off at Lawrence for coffee and a rest, and to utilise their free wifi (wow, these small towns know how to treat visitors) and then on to Roxburgh, where we went and checked out Pinders Pond, a very scenic parking spot. However, we ended up staying at the POP in town behind the Chemist shop. A good nights sleep and we will see what tomorrow brings. 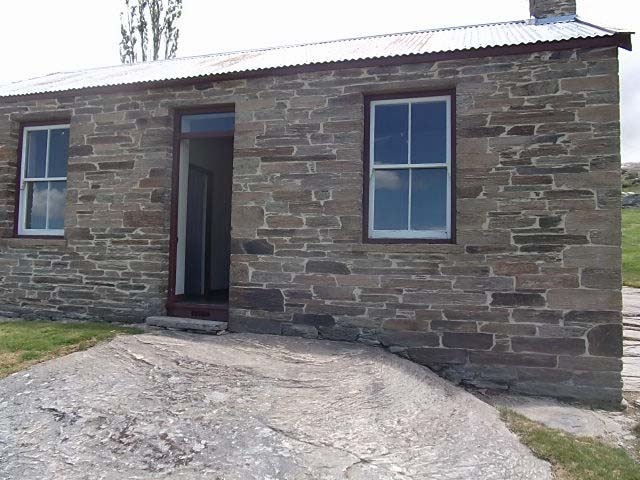 Friday we spent around Riverton including a visit to the museum, which we might add is well worth a visit with a fabulous interpretation of local history. Add this to your must see list if you are in the area. The above photos were taken on Saturday morning. Weather obviously not too bad, cold with a good stiff breeze. Stopped for some groceries on the way back to the racecourse. Walked back outside and was confronted with a white blanket of hail. All the way back out to the racecourse was similar. Arrived back and within ten minutes we were having a good sleet shower. Enough!!! Time to go. 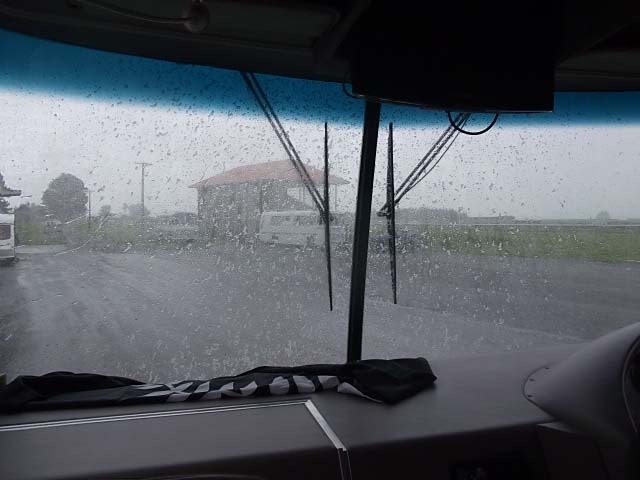 The weather was definitely not improving so we decided to pack up and head for the other side of Invercargill. 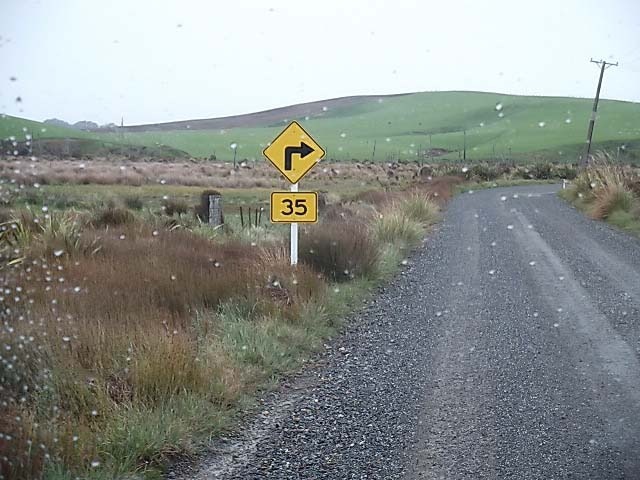 We started off in rain with a light wind, getting colder and colder as we approached Invercargill, with a good covering of snow on the ground by the time we got into Invercargill. Heading on through we ended up at Gorge Road, a small settlement 25kms from Invercargill. 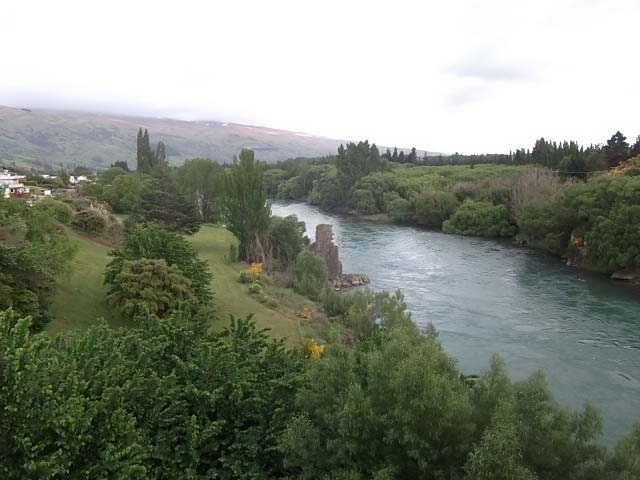 We stayed at the Gorge Road Club, settling in for a day or two to get a few things done and to check out the area. For the rest of Saturday we just battened down the hatches and retreated to reading and listening to the wind. Fortunately we were parked in a very protected spot beside a tall hedge which kept the rain and wind at bay. Sunday and it was time to venture forth. We had no internet access and so decided to explore to see if we could find some. Ended up in Edendale sitting on the side of the road. Good reception but not very comfortable in the car. Spotted in Edendale were these three obviously enjoying life. Giraffe, elephant with monkey on his back! 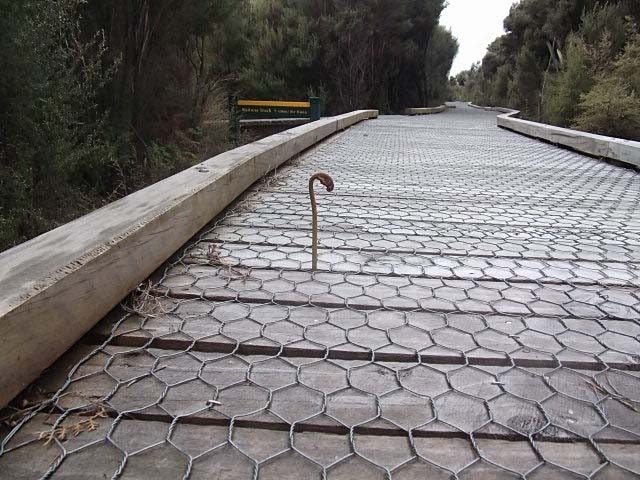 Later that day Roy ventured out to the Waituna Wetlands, an internationally recognised wetlands of importance. Not great afternoon weatherwise but good enough to get a good impression of the area. 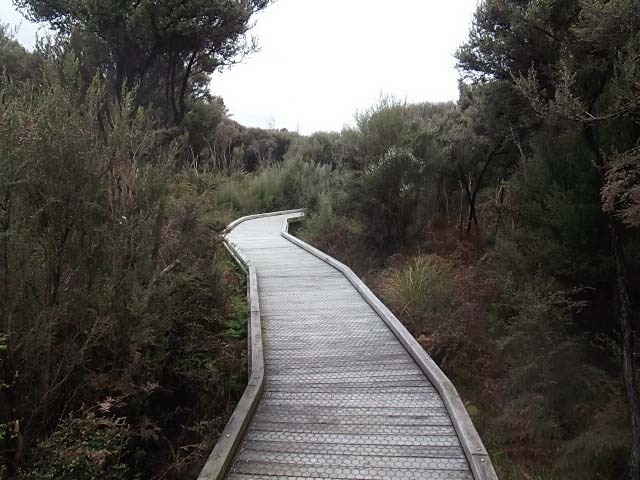 There was a walking track to an interpretation and observation site. 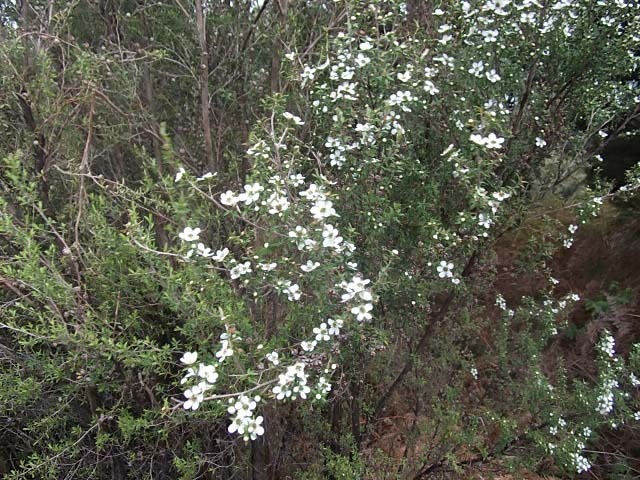 This was amongst manuka, flax, bracken and low growing shrubs on a boardwalk. 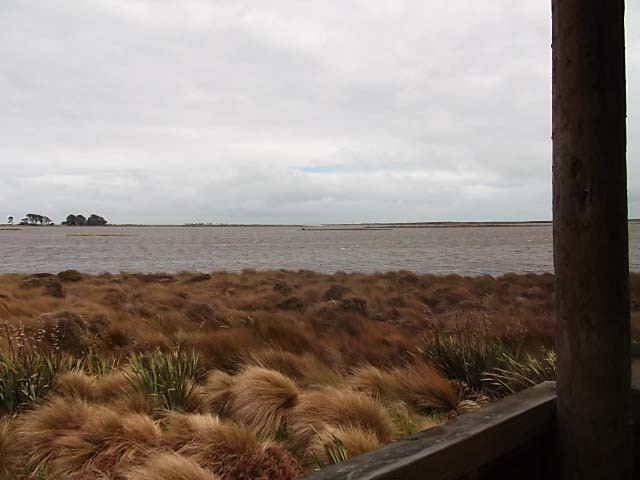 view over the Lagoon from the lookout. And in recognition of the slightly breezy weather in these parts, the toilet is tethered to the ground. As an aside we have come across a large number of these toilets. 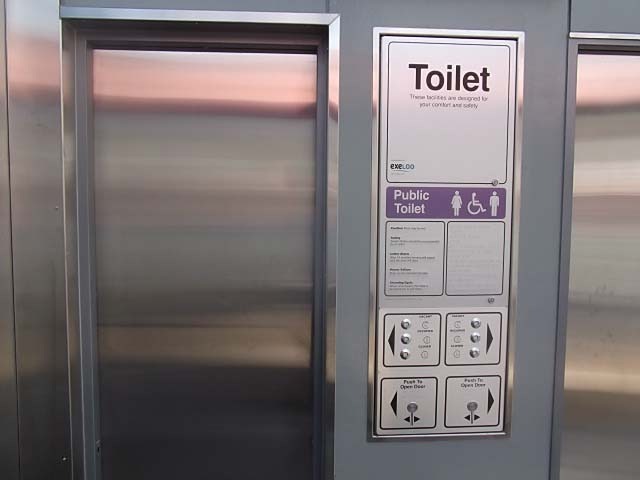 Without exception they have been tidy, clean, well maintained and in almost all cases have had toilet paper. 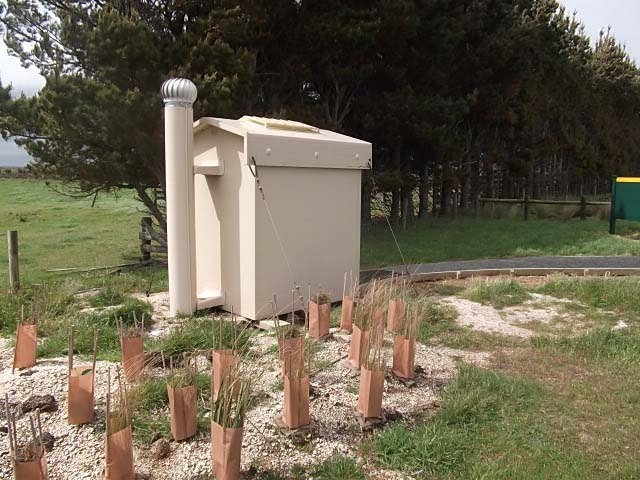 They are manufactured in Nelson and are in a lot of the DOC areas as well as being provided by a number of Councils in public parks. Unfortunately, there was no cell phone or internet connection around Gorge Road. 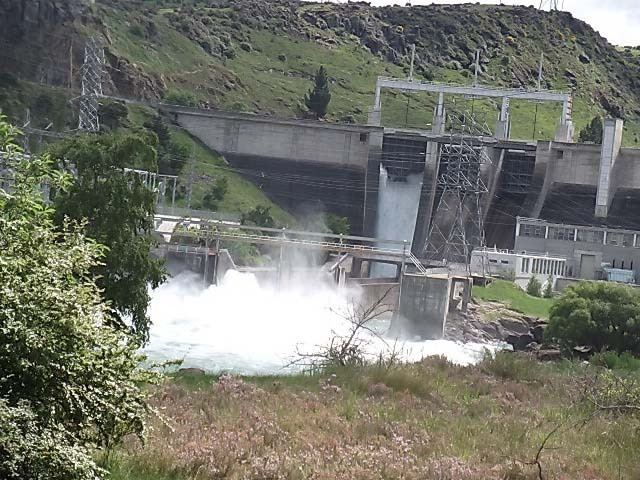 So by the time Monday came around, we decided to head into Invercargill to get some laundry done, shop for groceries, check the cell phones and check emails. Roy had work to do as well so most of the day was spent in Invercargill. 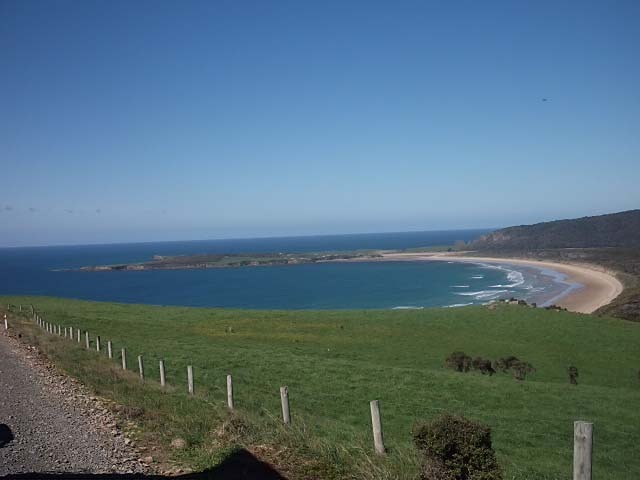 Tuesday was more of the same except when we returned to Gorge Road we packed and left to go to the Catlins. 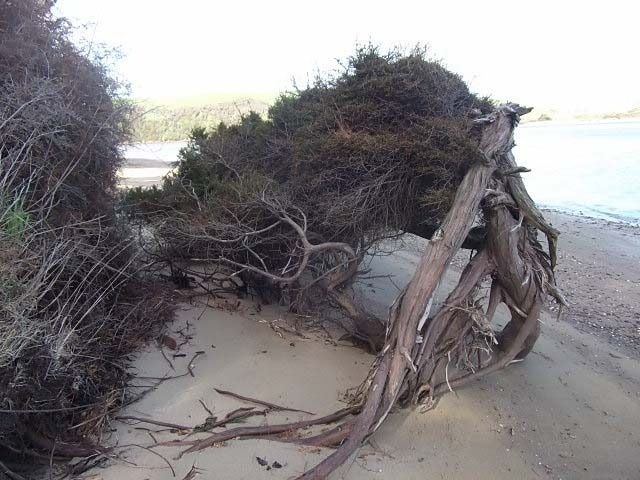 Our intent was to make our way through to Keirs Beach where we were told there was good camping. Stop at Tokanui for the dump station, windy and windy road, narrow and dusty. 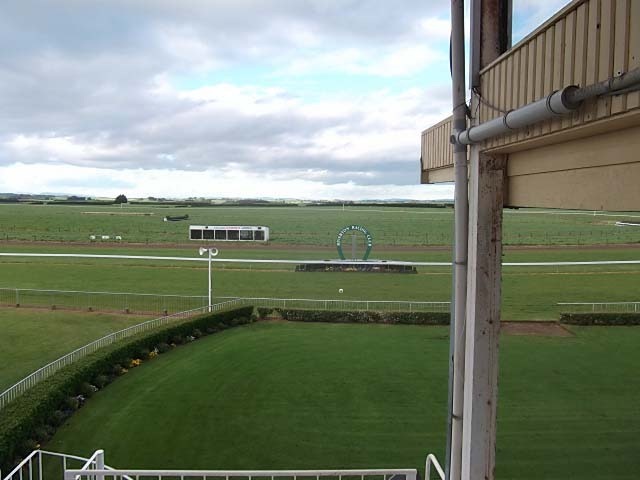 Arrived at Keirs, wind, no stabilisers, good ground. The stabilisers have now been on the blink for three days. They first started giving trouble in Riverton where the simple act of driving from one side of the parking area to the other resulted in the stabilisers becoming partially inoperative and intermittent. We will get them seen to as soon as we reach civilisation. Looking down on the estuary at Keirs beach. 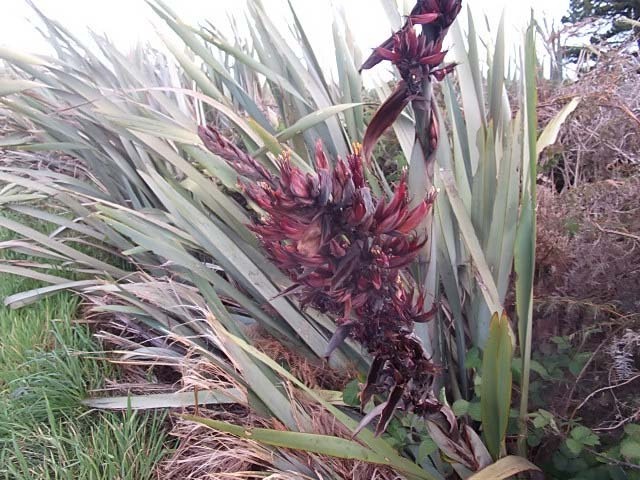 Having seen an enormous number of flax bushes throughout southern Southland, this is the first we have seen flowering. 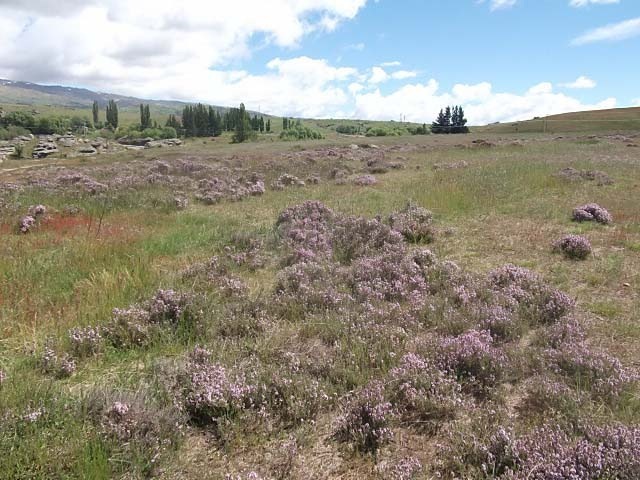 It would be interesting to be here when they are all in full flower the number of Tuis and Bellbirds must be impressive. In the estuary there are a significant number of different wading birds. The prize of these must be the Royal Spoonbills of which there is obviously a colony hereabouts. 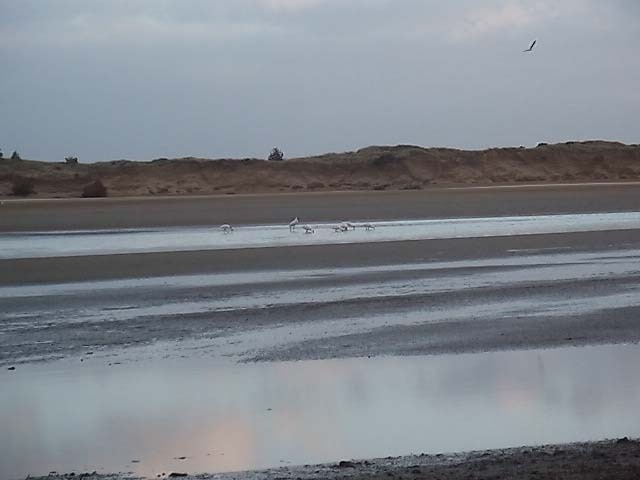 There were at least nine appearing at each low tide. 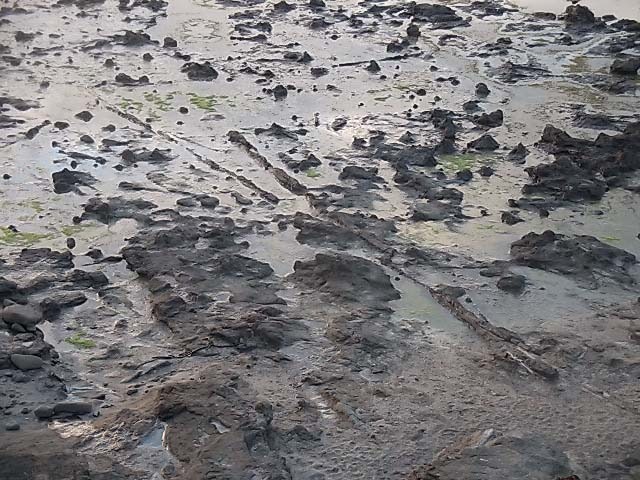 They were joined by a pair of Godwits probing the mud flats for breakfast and dinner. These were joined by Oyster Catchers, gulls ducks and a couple of smaller waders I had no knowledge of. The estuary at low tide, spoonbills fishing in the shallows. 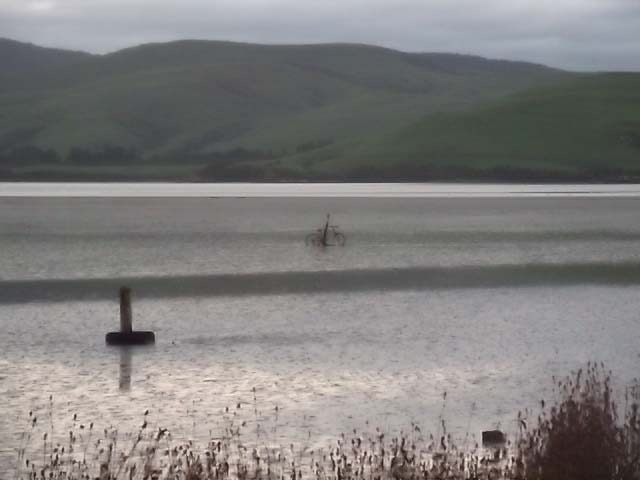 A Manuka tree which has had its roots washed partially out of the bank at the water’s edge. It us still growing with a very tenuous hold in the bank. 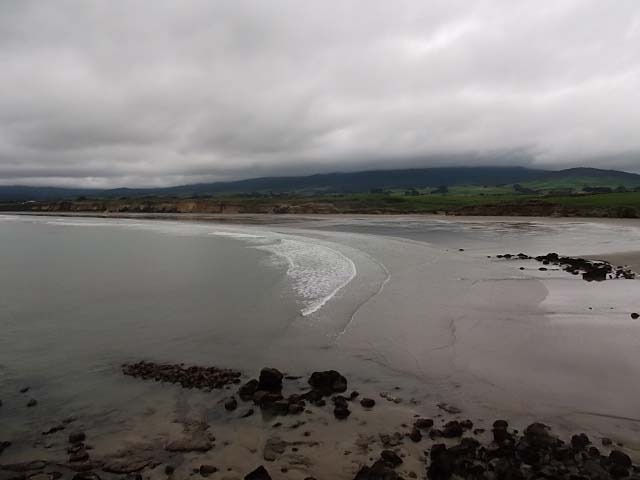 Wednesday we made our way to Waikawa to have a look at Curio Bay, Porpoise Bay and the Niagara Falls. On the way we travelled on a metal road for most of the distance. Bernice becoming a little concerned that the road was becoming more difficult as we progressed. The speed on corners gradually diminishing as we went. Fortunately it was reasonably flat but subject to tidal inundation in places. 25 here, but this time we were led to the corner by a mother and her off spring. Finally arrived at Waikawa and decided to stay at the Community Hall parking area. 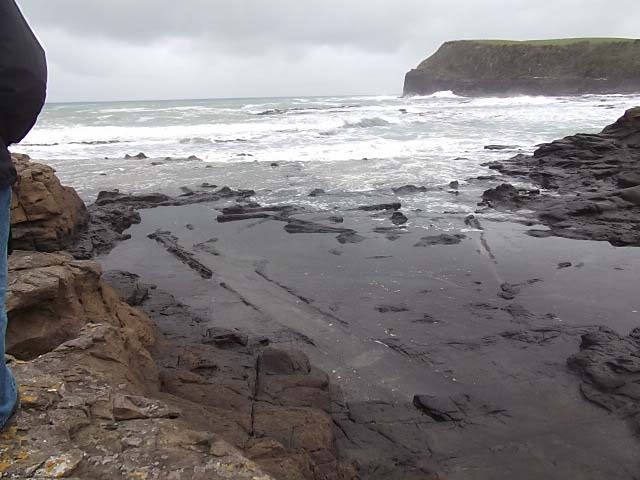 Once we were safely parked we then took off in the car for a look at Curio Bay and Niagara. 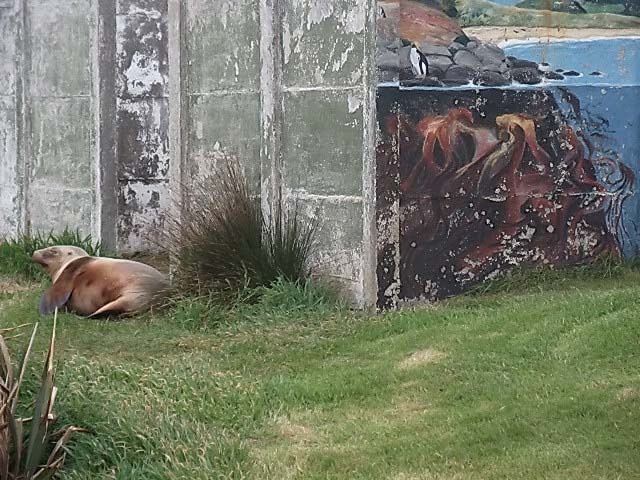 At the camping ground above Curio Bay we spotted this sea-lion having a break from the water in a sheltered place next to a derelict concrete building. The sea lion is all of two to two and a quarter metres long. 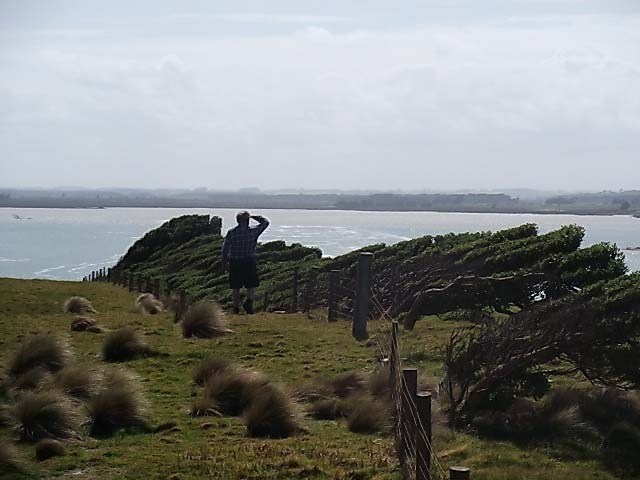 On the way into Curio Bay there is an example of the use of Flax as a wind break. 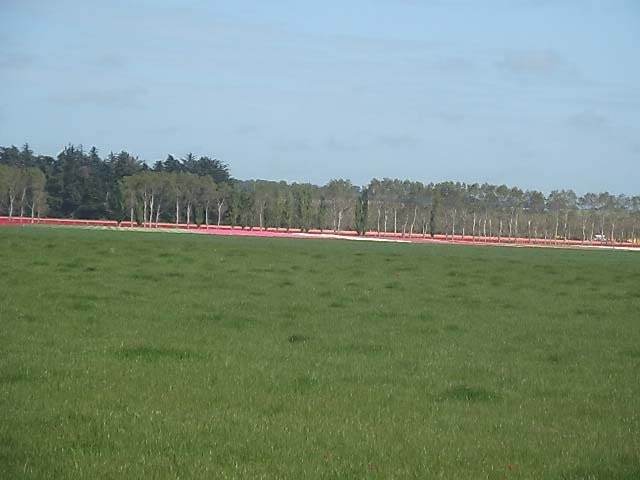 Here either side of the track is protected from the usual Southerly wind by rows of Flax on either side. 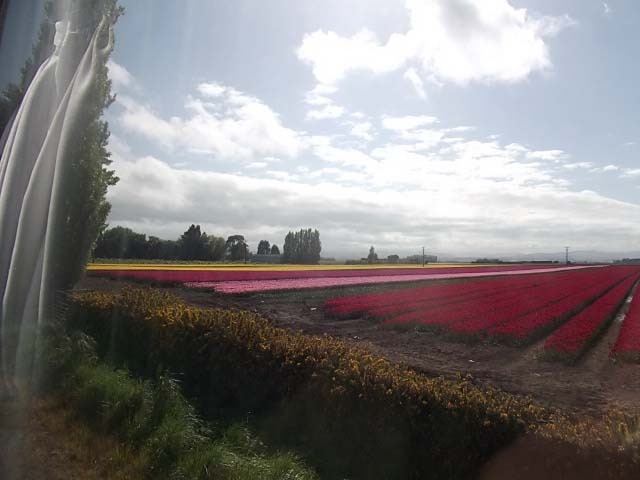 Throughout our southern coast travels we have seen flax windbreaks used extensively as one would see gorse in other parts of New Zealand. the trunks of trees are very obvious from this height. 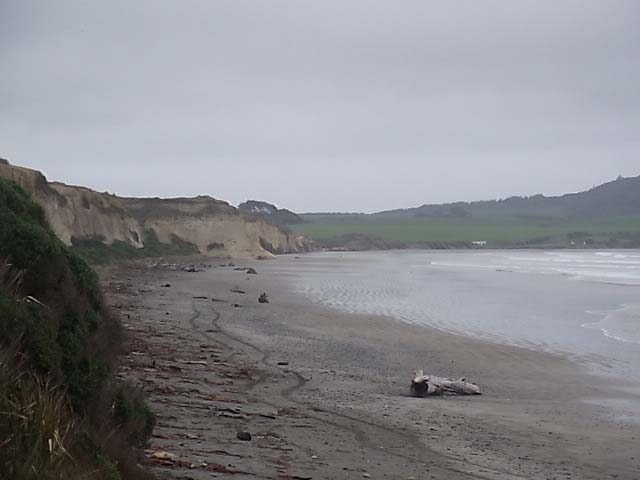 Porpoise Bay looking toward Curio Bay headland. Not quite in the same class as the North American version. Obviously an early surveyor had a sense of humour! 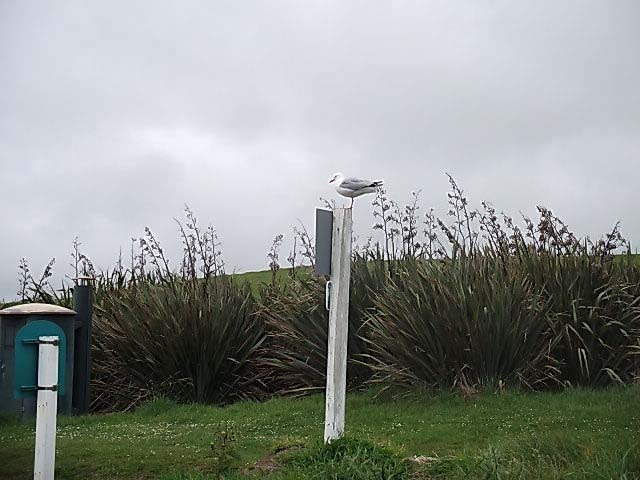 In the estuary in Waikawa came across an unusual channel marker. just in case you need to ride home after mooring the boat! Decorative gates are a feature of several properties in the area. 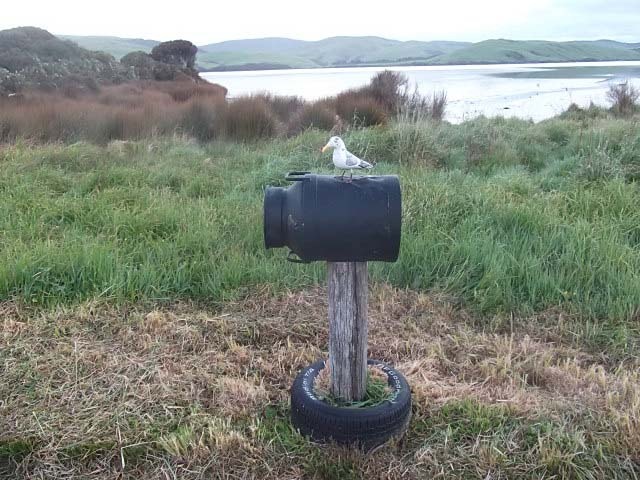 A permanent visitor to this letterbox. Yes we did move from Fortrose irrespective of the fact of having a great time there. We needed to find access to the internet to do all of those end of month tasks and catch up on all the news. Made our way to Invercargill, but on the recommendation of several people stayed at a POP some 10km from the centre of town at Makarewa. Off to the laundry, stock up on some food, visit the Library (free wifi), cd covers, envelopes, late lunch (mundane, have to be done tasks). Just goes to show that this life is not all beer and skittles. Or should that be wine and whitebait? Accounts, laundry (different one for drying), work, post. Oops did not get back to the laundry in time to pick up clothes. Moving day. Picked up laundry and headed out west. 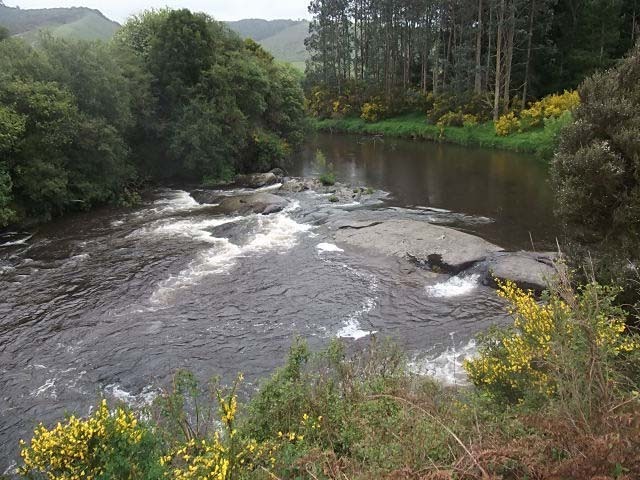 We have decided to stay a few days out toward Tuatapere and then slowly make our way back to Invercargill and then through the Catlins. 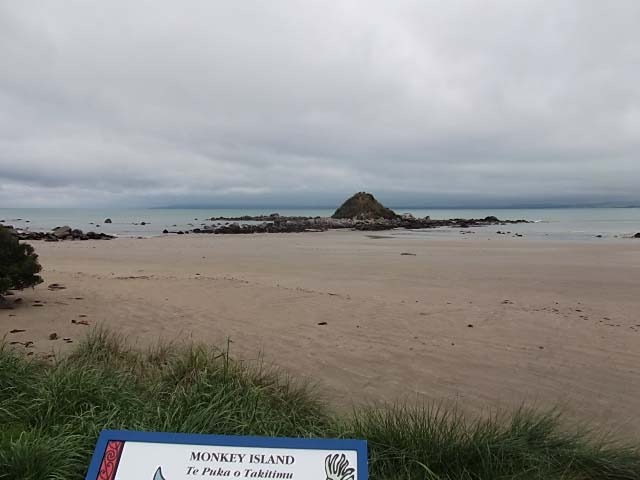 Arrived at Monkey Island, which had been a recommended stop over from a number of people. 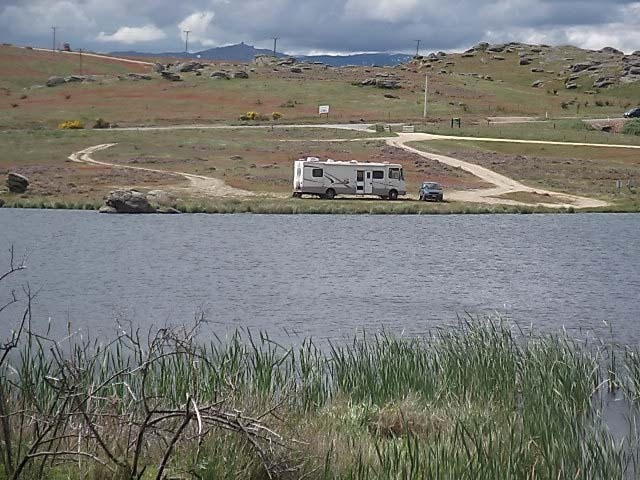 We were the only motorhome there when we arrived but there was one person staying in a caravan. He had been there for some time with his wife so gave a good account of the area. They had spent many a Xmas with family in the same spot so knew all about local conditions. 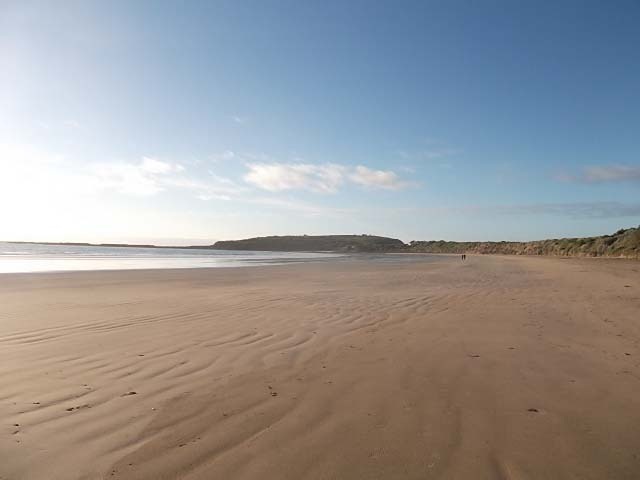 Lovely long sandy beach stretching well off into the distance. Looking inland. It is noticeable that in this part of the country flax is often used as a wind break and hedging around paddocks and properties. 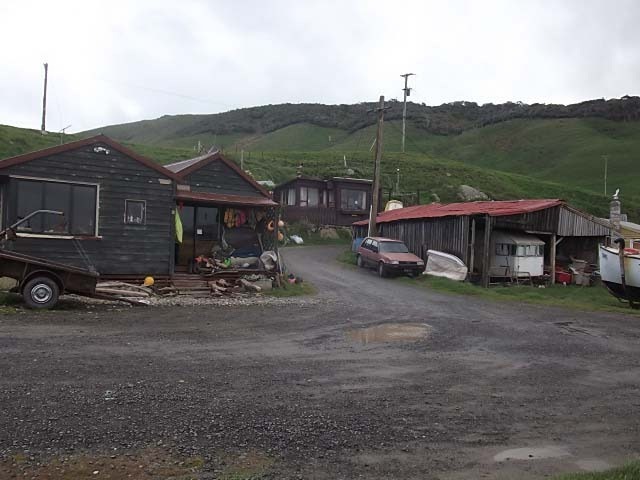 Roy hopped into the car and headed off to Tuatapere to get forgotten supplies, calling in at several spots on the way. 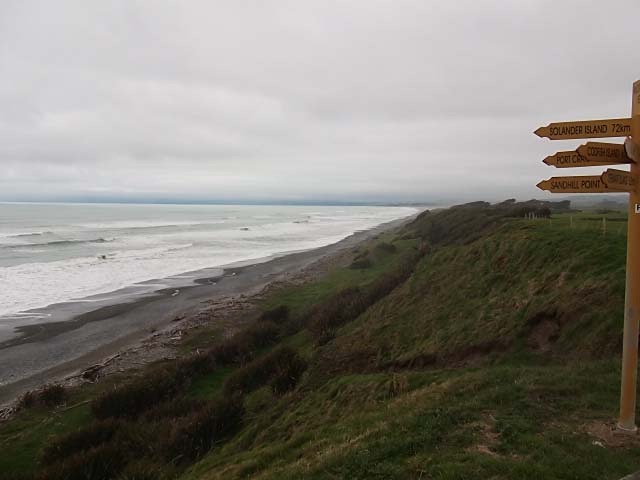 McCrackens Rest is the most South Western point in the New Zealand road network. 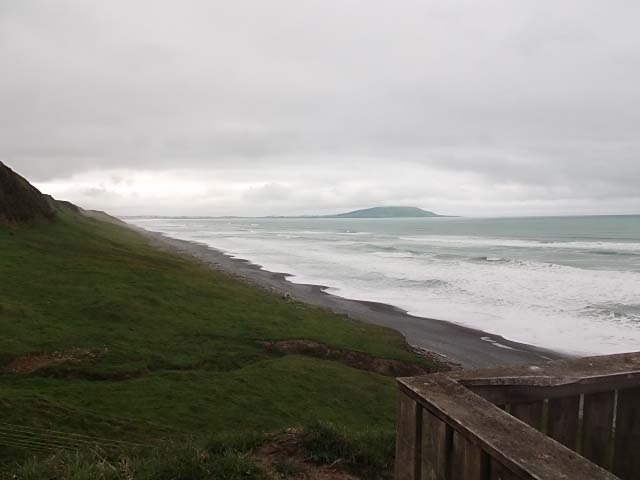 The view provides an appreciation of the immense size of Te Waewae Bay. The whole of the bay is protected from commercial fishing and provides a breeding ground for many types of fish. Looking to the East. We are camped below the rising headland in the background. 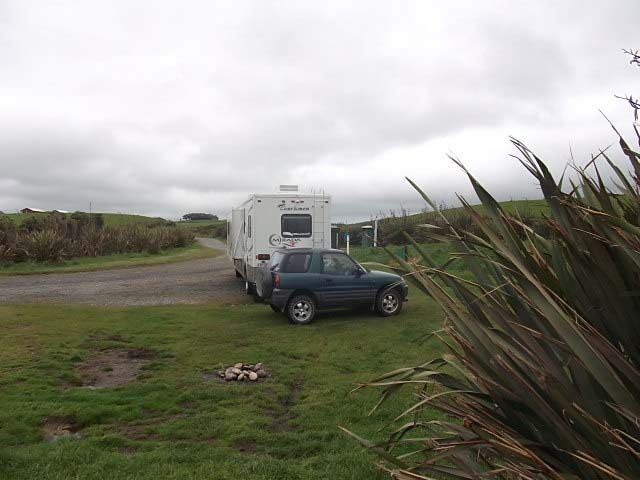 Also called in at Orepuki beach and took this photo showing our motorhome in the far distance. A little concerned to find that the forecast was for deteriorating conditions throughout the rest of the week and into the weekend. Already there was a stiff breeze getting up. Well one did not require rocking off to sleep last night but that is exactly what happened. 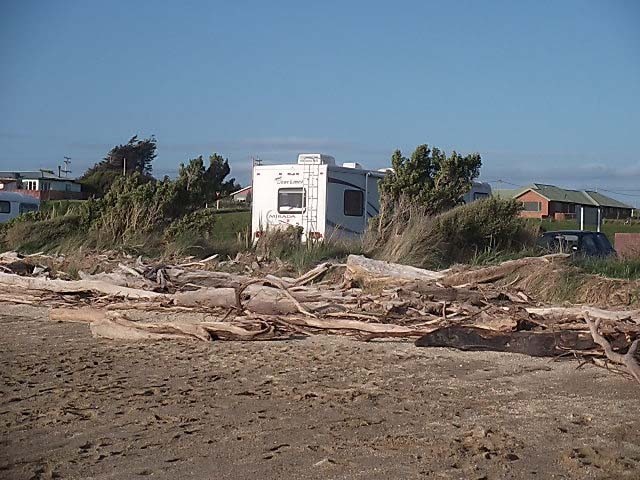 During the night the wind increased and the motorhome was rocking quite nicely in the stronger gusts. Fortunately Bernice had stowed the TV antenna else that would have gone. Looked at the forecast and saw deterioration was definitely on the cards. Spoke to the local who suggested that where we were was going to get worse. Decided it was not necessarily too bad but that it would be nice to find a quieter spot to hide for a couple of days. So off on an explore of the area in more detail. 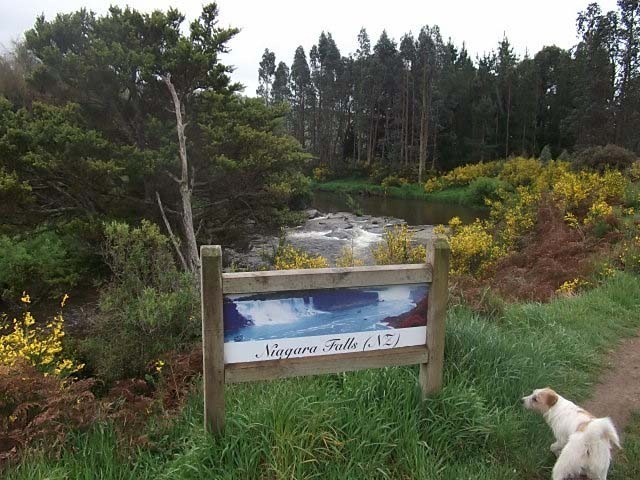 We headed off in the car to Tuatapere for fuel and to explore the area. 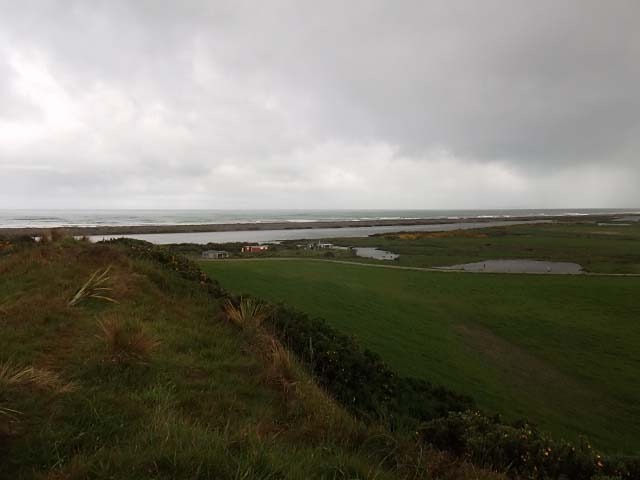 The whole weather situation appeared to moderate the nearer we came to Tuatapere. 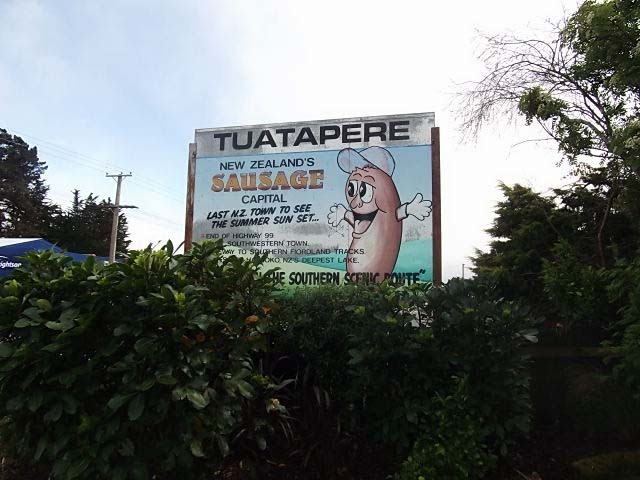 Tuatapere sign acknowledging the reputation of the sausages from this town. 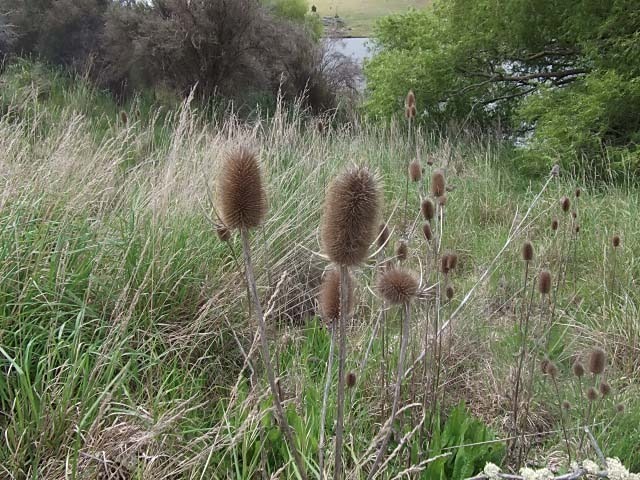 Unfortunately Tuatapere has long gone past that attractive stage. There was a motorcamp there but little else to do or see. The Hump Ridge track was likely but in the weather conditions was not a real option, perhaps next time. So back to Monkey Island except we will stop at a number of likely looking places on the way back. 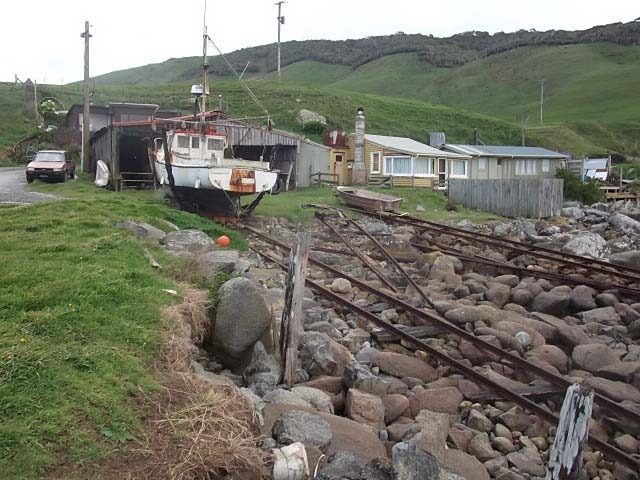 First stop was the Fishing Camp on the shores of the Te Waewae lagoon. 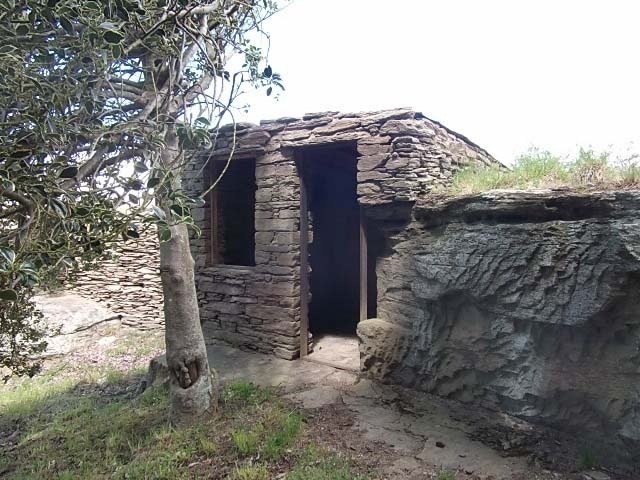 A likely looking spot in an old shingle quarry, well perhaps not that old, surrounded on three sides so likely to provide shelter. However there was little attractive about the environment and it seemed as if we would be not achieving much of a gain in protection. 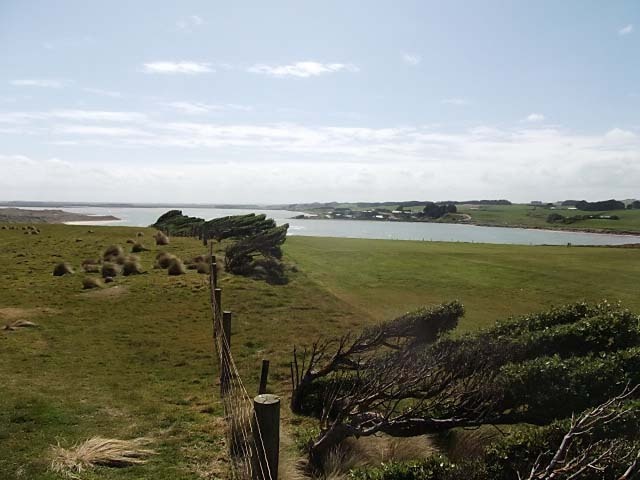 The Te Waewae lagoon looking toward the Waiau River mouth. Next stop was Gemstone Beach where we called in. Yesterday when Roy called in there were a group of three English guys who had lost the keys to their van on the beach and were having to wait until a new set reached them. 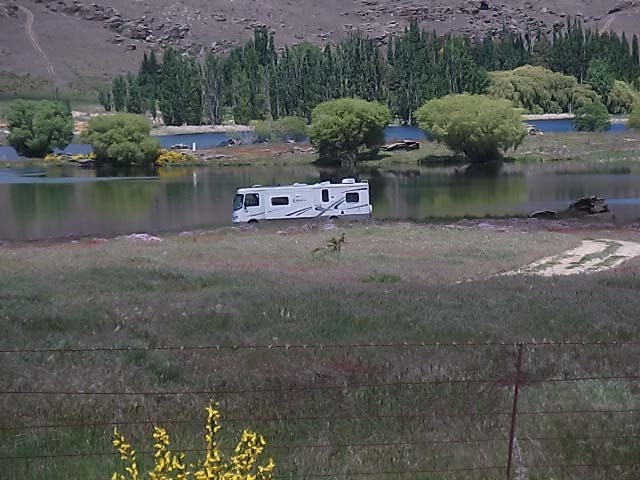 Well today we found them still there but a tow truck had turned up to take the motorhome back to Invercargill and they were going to go on to Te Anau in a car, to pick up a motorhome in Queenstown. Of interest was a guy who was panning for gold. Well he was actually sitting out of the weather in his car while the panning was being done by his very crafty sluicing set up. For those of you who saw the recent Gold Rush series on TV here is the opposite in terms of technology. 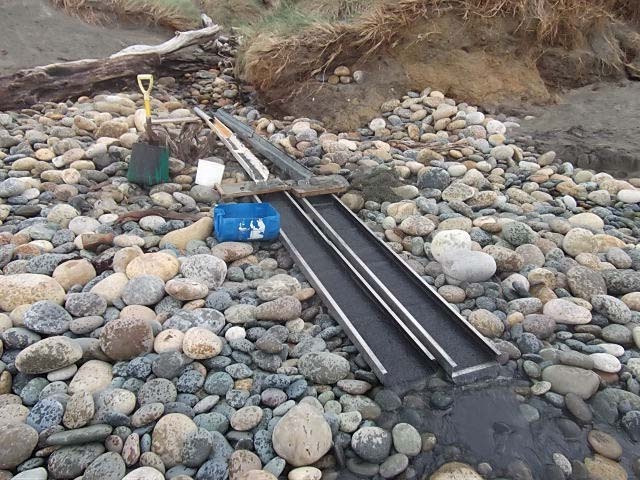 The operation is based on the use of water from a small stream emptying onto the beach area. 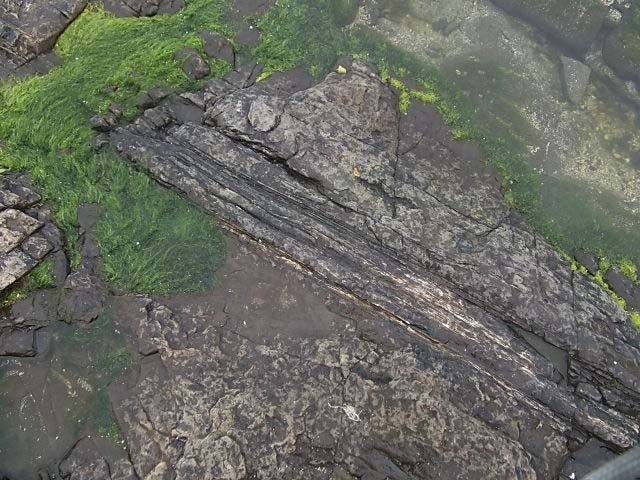 This has exposed the underlying rocks (we could not see any gems!!). 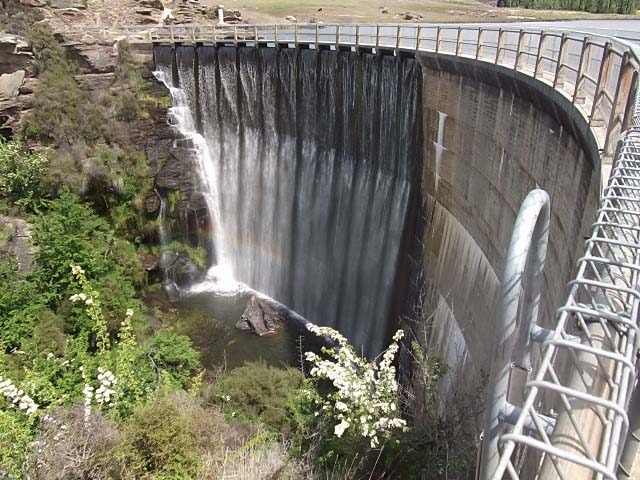 The sluices are based on the use of guttering to control a flow of water. 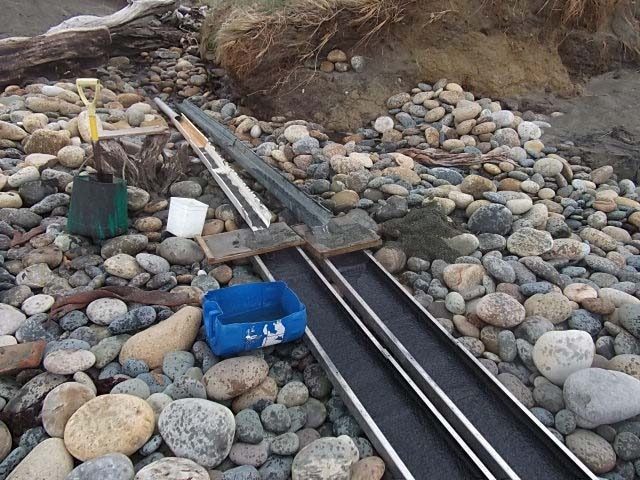 The upper gutters are where the black sand is introduced by simply placing quantities into the guttering. The flowing water then carries a small quantity at a time onto the screen separating the next section of gutter. 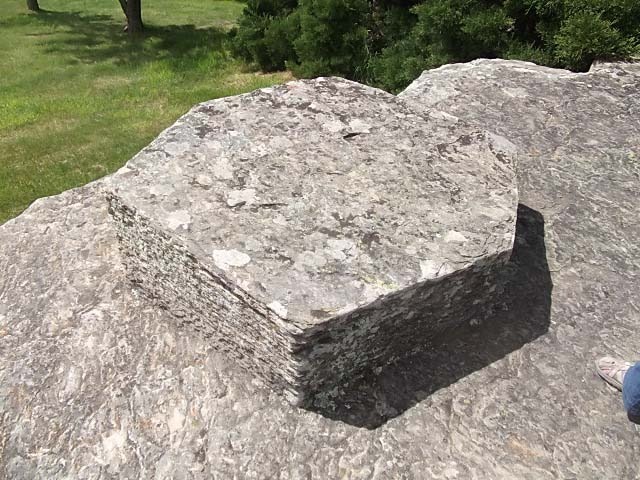 The screen traps larger particles of stone, probably down to about 1 mm. 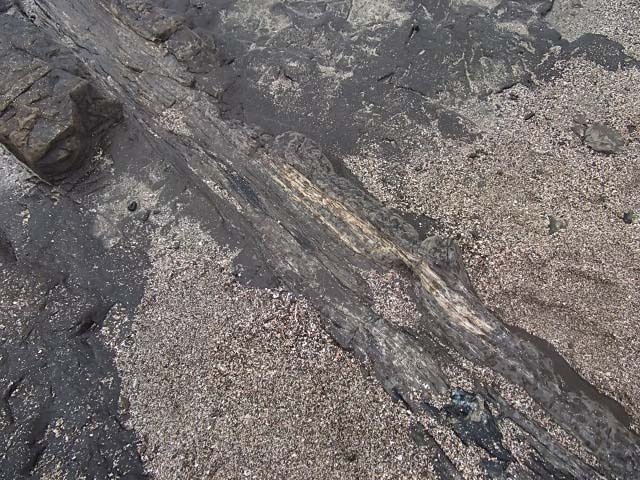 The residual sand then proceeds over the lower gutter that is riffled and has matting along the length of it to trap gold in the riffles and the matting. There was no apparent sign of gold but there must be some chance to have such an operation set up. I am not sure where the sand originated but I suspect it is found further along the beach at a stream exit. 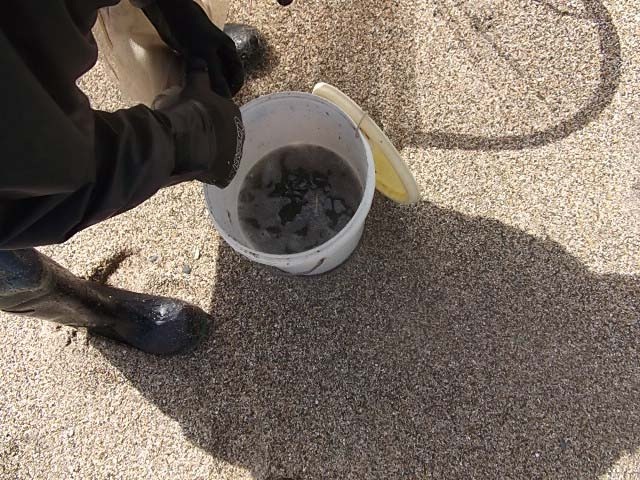 The sand being sluiced is contained in the bucket with the spade in it. The other two buckets contain water for washing the gravel trapped on the filter. Closer shot of the setup. We made our way back toward Monkey island but bypassed it to have a look at Cosy Nook. 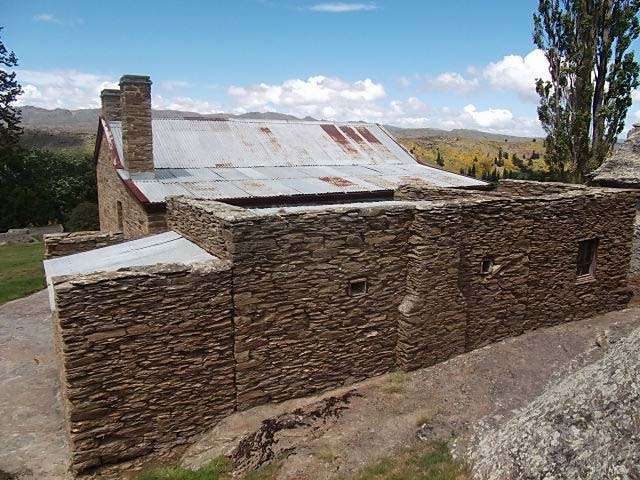 We had previously visited here with Helen and Don and thought it worth a second look. Once again we arrived in bad conditions with a very strong cold wind blowing. 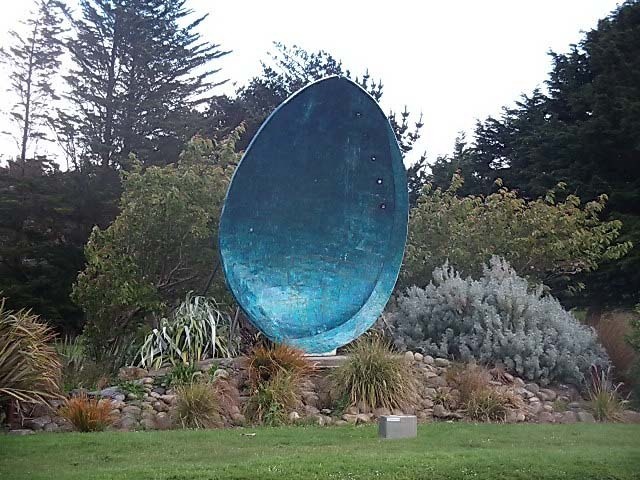 But it is still a unique location the nearest to which we have seen is probably the kaiks down at Moeraki. 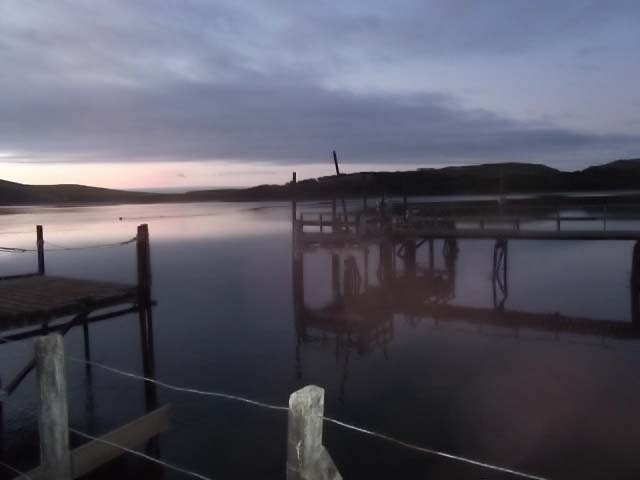 It was a fishing village with a large number of boats operating from the area, but it was fished out long ago so now there are only six or seven small batches/cribs, a slipway with an old boat on it and that’s about it. There is obviously good seafood still available in the rocky foreshore as there was a group of three, wetsuited and carrying heavy catch bags, guys emerging from between the rocks heading back to their ute. We carried on further to Colac as there was notice of a POP in the area that might be appropriately sheltered. However as lovely as the beach is there was nowhere that looked any better than where we were. 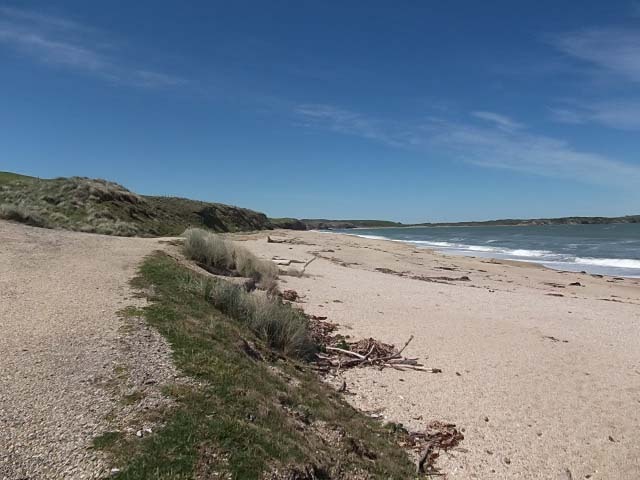 There was a sheltered spot at the western end of the beach where there was a protective headland, however any change in the wind direction would have left the area very exposed. An interesting aside. On the way to Tuatapere, in Colac Bay and at all points in between there appeared to be no cellphone reception and hence no internet. However there was a strong signal at Monkey Island. 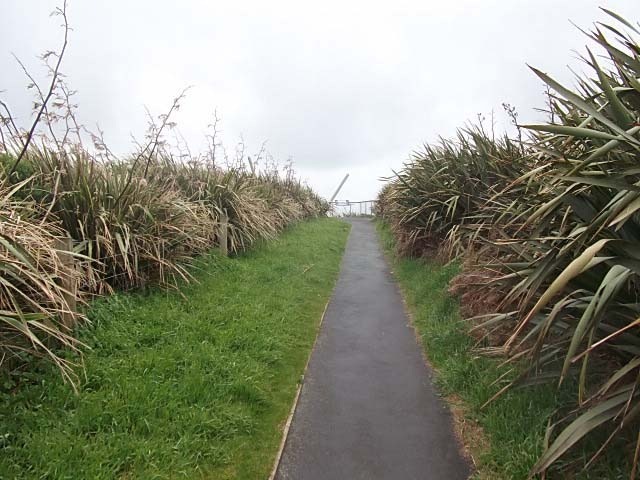 On further investigation there appeared to be a low level transmitting tower just behind Monkey Island pointing in the direction of Stewart Island, so perhaps as result of that there is a corridor of reception in a very localised area. However back to the narrative. In all our travels this morning we were chased along by a very strong cold wind and showers. This may not be apparent in the photos but it was really freezing particularly in Cosy Nook!! Things were looking no better anywhere. Consulted with the local again and was told that the stretch between Colac Bay and McCrackens Rest was the windiest part of the coast. 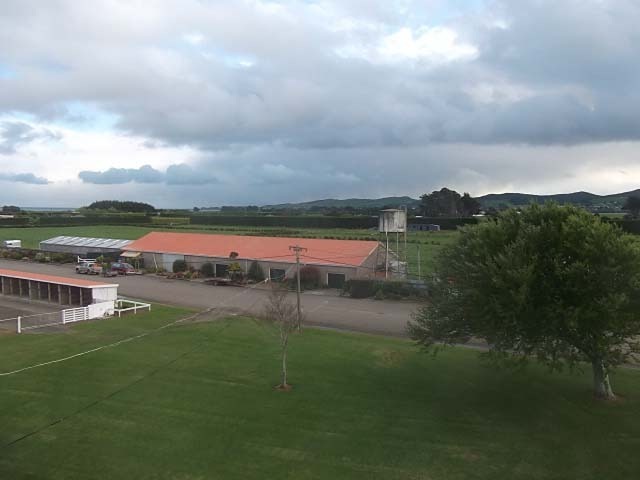 It could be blowing a gale here but could be quite calm in Tuatapere and Riverton. 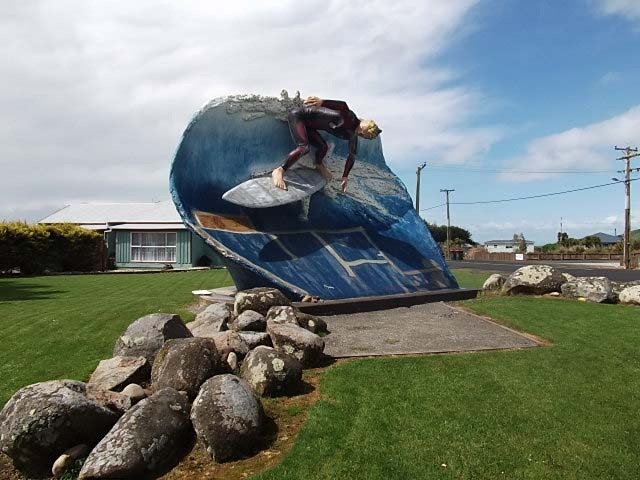 So we made the decision to move back to Riverton and leave this part of New Zealand for an explore at a later date. Sure enough as we got closer to Riverton the conditions improved to the point where we had the late afternoon and evening in sunshine with little wind although it did start to get chilly and some hail fell late in the day. 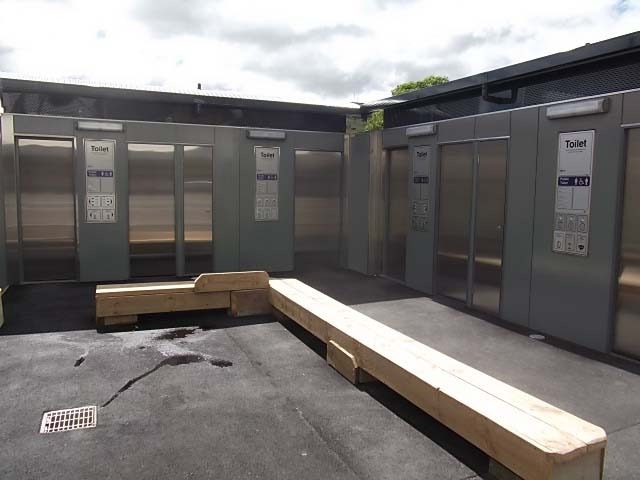 So we are now ensconced at the Riverton Race Course on power, charging everything in sight, laundry done, settling in to watch the final of Australian Master Chef, about to tuck into a feed of Tuatapere’s famous sausages. Looking Southwest out the back of the stand. 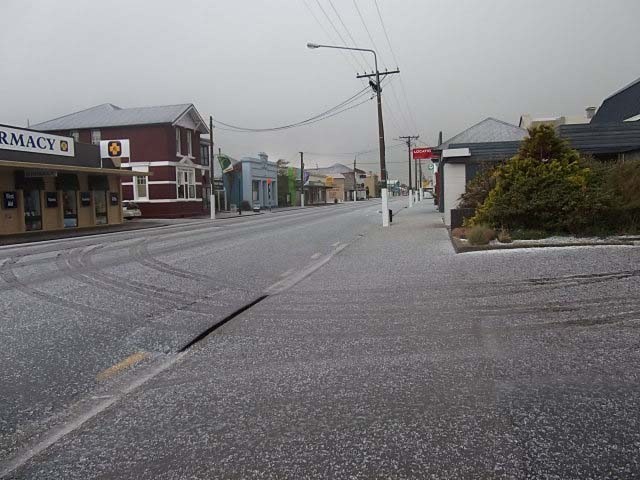 PS: Late afternoon hail, freezing temperatures and then during the night the gale force winds started. I think we may be here for a few days until this series of fronts pass onto all of you north of us! 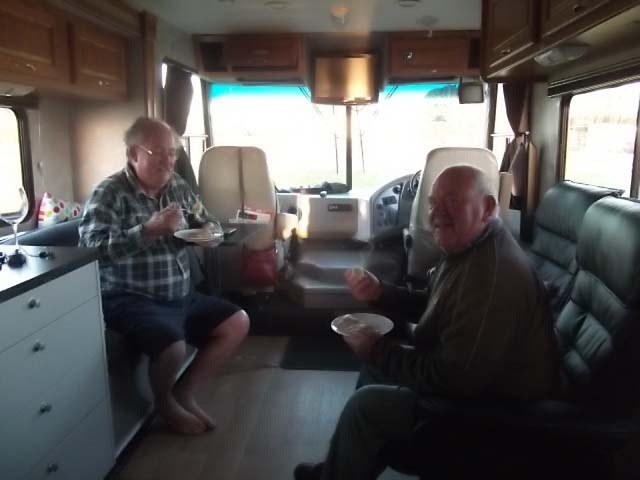 Whilst staying at Gore, we met another couple Jim & Jude, who seem to have a similar story to us; they had a B&B, sold that, went on a bit of a trip to Europe, now live full time in their bus called “7 day weekend”. Jim & Jude headed off yesterday to Fortrose as Jim wanted to do a bit of flounder fishing. 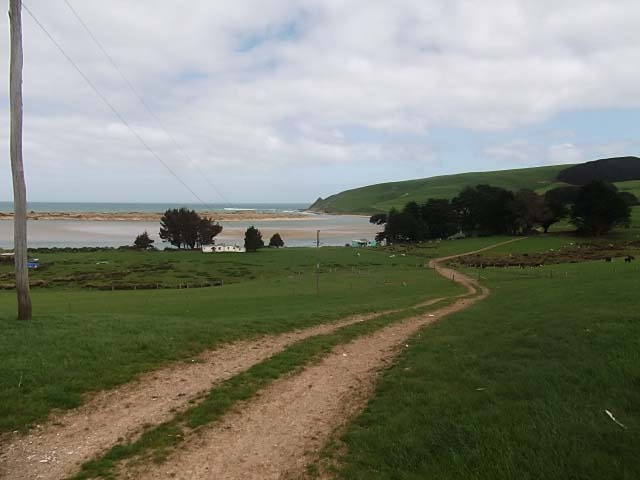 Jim apparently invited us to come and join them, so instead of leaving Gore and heading right, we turned left and headed toward Fortrose which is along the coast from Invercargill and is the start/end of the Catlins. What’s all that colour over in those trees? Are we back in Holland?? 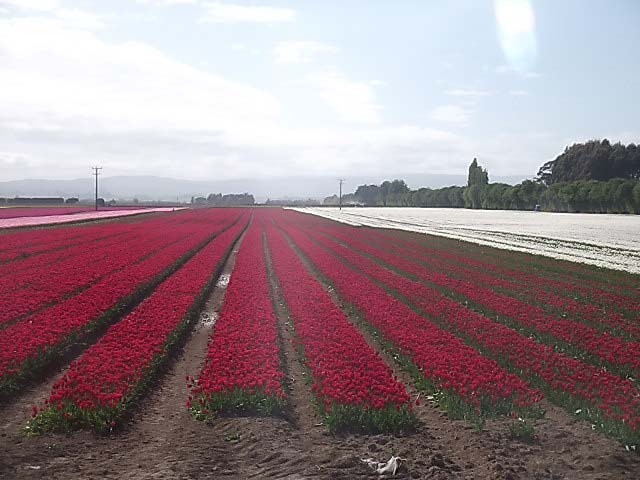 No, fields of tulips between Edendale and Seaward Downs. 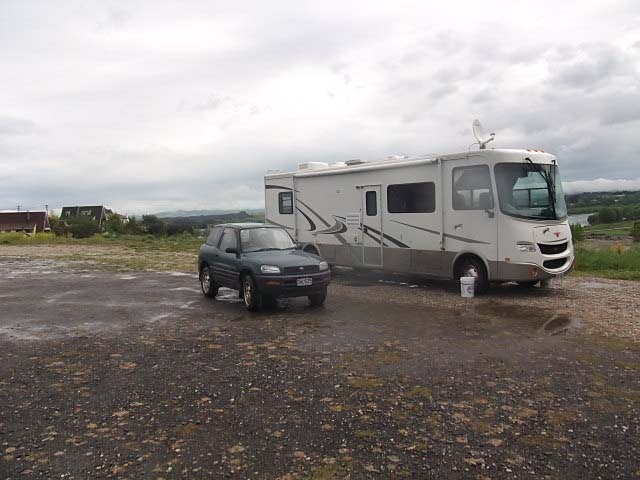 We arrived in Fortrose and parked up along the estuary, and funnily enough we met up with two other couples that we had met at the Rally in Tapanui. Pleasantries exchanged, we agreed to meet later for the obligatory happy hour. Van parked up at the estuary. 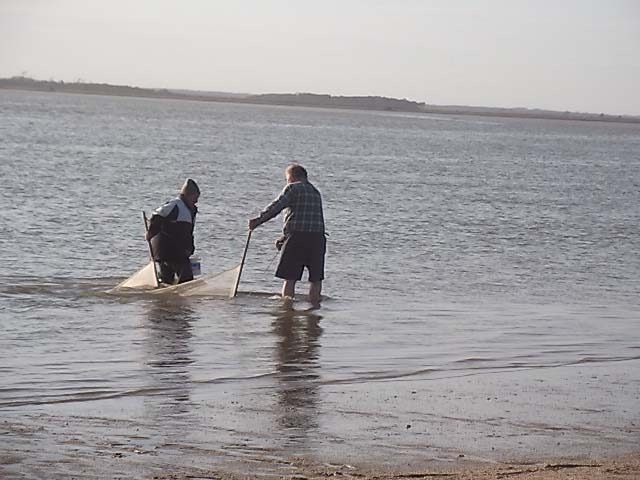 When we arrived Jim was about to set a net for flounder in the estuary. So he and Roy waded out and anchored the net in an appropriate spot where we could keep an eye on it. Then they took off to have a look at the whitebaiting at the mouth of the estuary. Some of them were up to their armpits in the water where they were contending with the incoming waves as well as a strong incoming tidal current. Not necessarily the safest occupation! After they returned we went for a drive to the top of the headland overlooking the estuary entrance where there was a golf course. 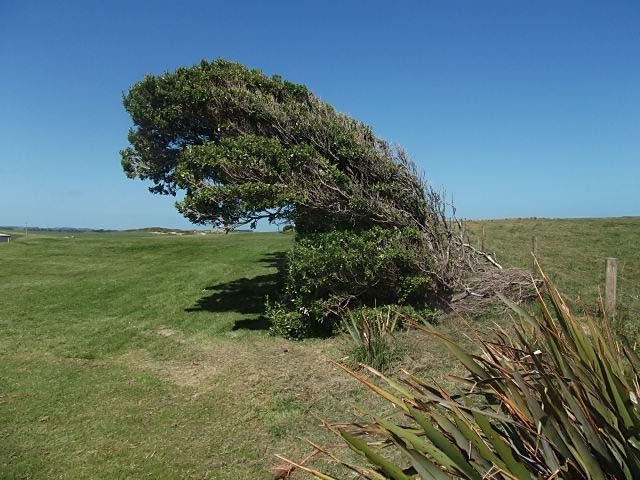 On the seaward side of the golf course there was a row of trees which gave a good indication of the prevailing wind direction. Windswept trees on the golf course boundary. 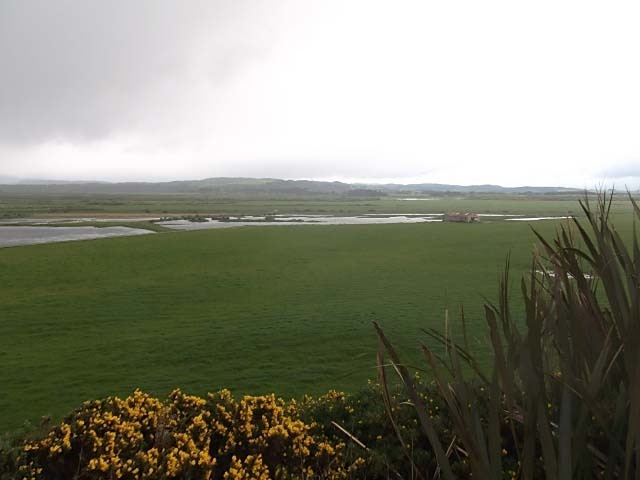 Estuary in the background. We had called over to Jim & Jude’s for a glass or two before dinner, when the guys noticed that the buoys on the net could no longer be seen. The net had been dragged along the estuary down towards the entrance. Whilst trying to figure out how to best rescue the net, a couple of whitebaiters came to the rescue, one had a small boat that he and Jim launched and went off to rescue the net, in exchange Roy stayed with the lady and helped whitebait along the shore. 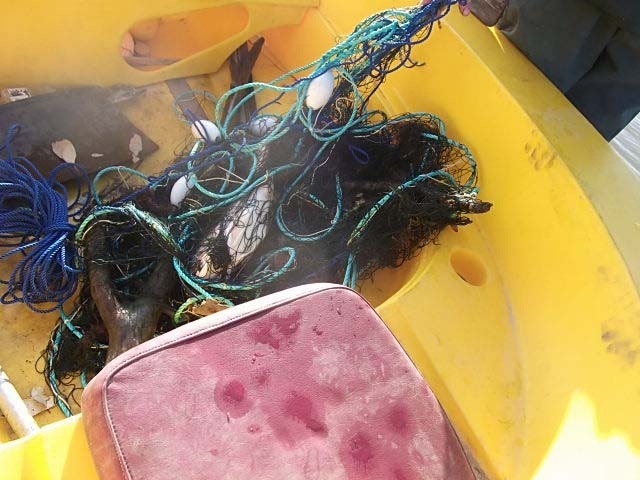 The net, a tangled mess, was duly rescued. and this is what it looked like. There is a red cod in there! We then set about trying to untangle the net and also release the Red Cod that had been caught. Roy & I spent the next 30 minutes or so, carefully untangling the net and sorting it all out (must be all that patience learnt doing jigsaws!). Meanwhile Jim filleted the red cod as we felt that was only fitting that we give half of it to the whitebaiters in thanks for their assistance. Roy was lucky enough to be given the whitebait that he had helped catch, there was plenty enough there for a decent patty or three. I have to say that I have never cooked whitebait that fresh before, so fresh in fact that even after mixing it with the egg, the whitebait were still jumping, and even when they hit the pan, they were wriggling for some time as well! One patty, covered the whole frying pan, big enough for two. 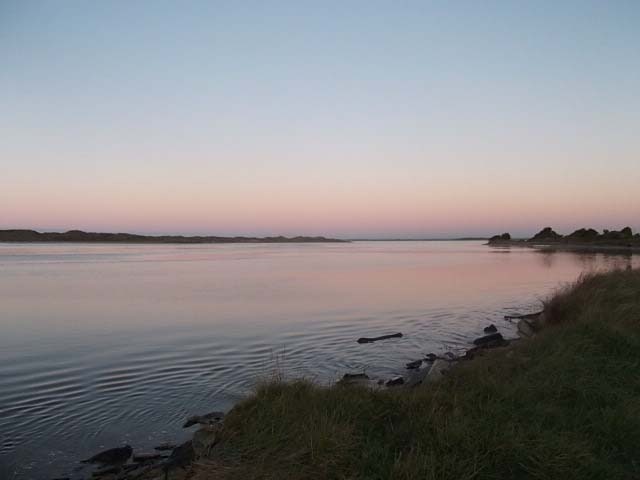 and finally a lovely sunset on the estuary. Dawned a windy but fine day with little cloud in the sky. Roy went early morning walking onto a beach at the back of the golf course. 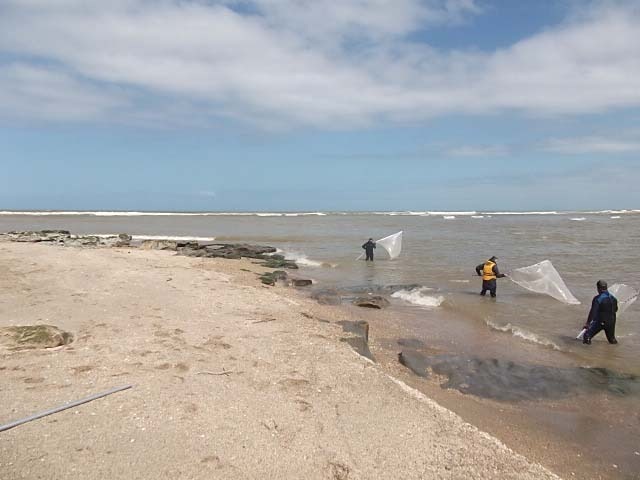 It appeared to be a good spot for fishing and with an off shore wind a good opportunity for kite fishing. After everyone was up and about a discussion ensued as to the best place to go kite fishing. Some local people recommended that a beach further round than the one below the golf course was much more accessible. So Jim and Roy took off to see what they could catch. It was a beautiful day with a good offshore breeze, no shelter from the sun, but shelter from the breeze as we were below a ridge which ran along the beach. After several hours we had launched three different kites, the first two proving too small in the breeze. Finally we had the third one well out beyond the breakers in a current running, from the rocks at the beach end, parallel with the beach. A great place for catching the passing shoals. No such luck! The baits were not even touched, and then to top it all off the kite plunged into the water when we were retrieving it and it took some time to get it out. So no fish for four hours of effort. Hungry and thirsty we made it back to the camp, sunburnt as well. Fortunately, Bernice thought that the fish quota may not have been filled so a bacon & egg pie awaited the hungry fishermen. By this time it was low tide so Roy decided to try his luck gathering a few cockles aka clams with much better success. 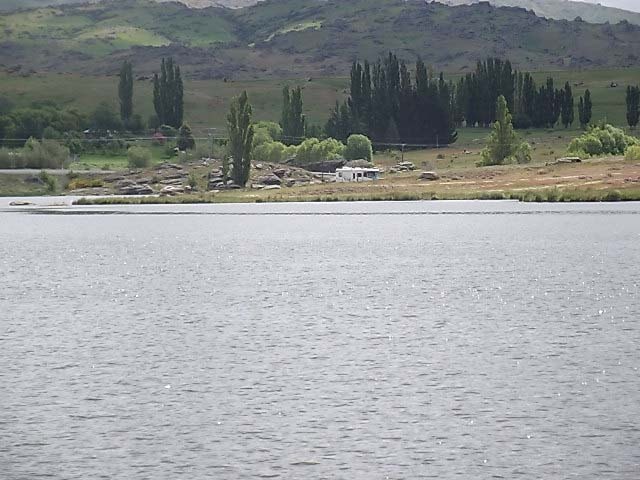 An acquaintance of Jim & Jude had also lent them a whitebait net, so undeterred, the two blokes went off to try their hand at white baiting, with even more success. 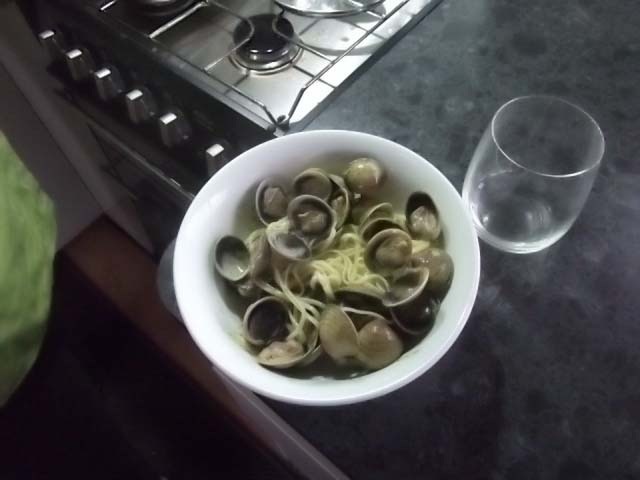 Dinner ready, Clams with linguine and a parsley, anchovy, caper dressing. Oh, the whitebait fritters were consumed for entree before we remembered to take a photo!! A slow day after the busy day yesterday, the red sunburnt faces being kept out of the sun and wind today. 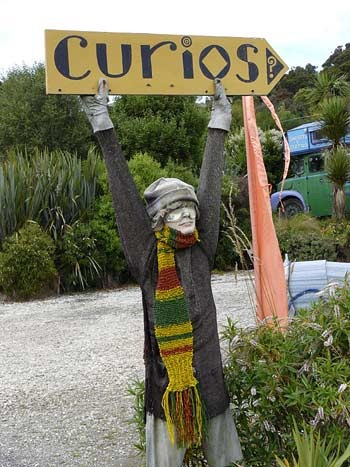 Bernice & Roy went for a drive to Tokanui, in the hope of getting a paper. We are missing the ODT and we try and get the Saturday edition so we can do the cryptic crossword. However, no luck, so back to the van where we were met by a local farmer selling fresh free range eggs – great entrepreneurism, what is the one thing whitebaiters need? Eggs for the fritters! Roy had been told of a better place to get clams, so off he went, but 5 minutes later returned. Why? He had a full bag of clams. 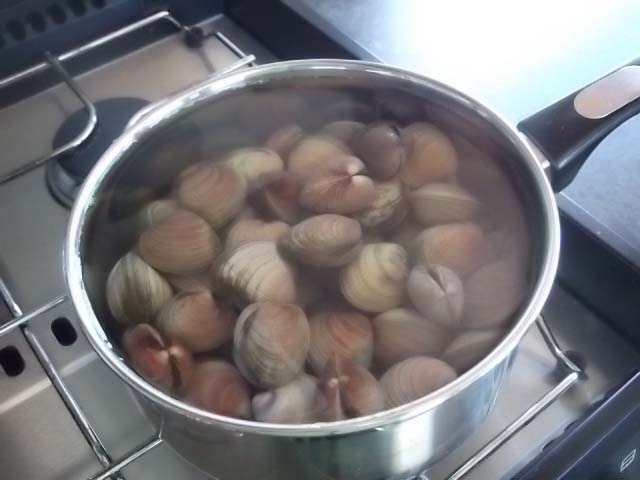 We split his spoils with Jim & Judy, as they had not tried clams before. Jim and Roy decided to try their luck again white baiting, meanwhile Bernice broke out the wool and knitting needles. After an hour or so, Bernice went out to check on the men, and spent the next hour or so, wandering along the beach with them, retrieving their catch from the net and cleaning out any strays. 1.4kg of whitebait later, we split the spoils. 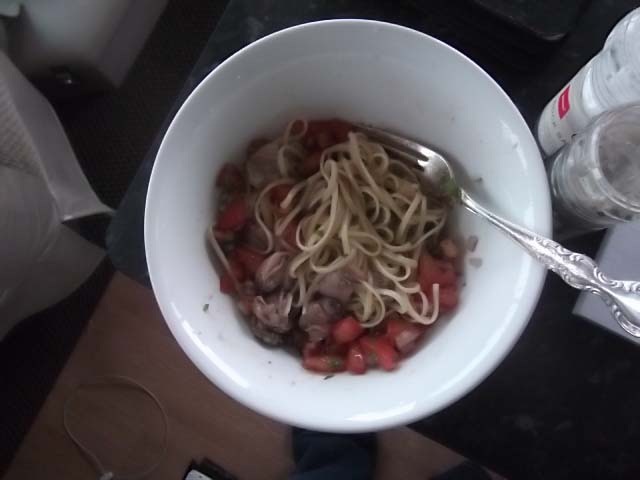 Clams linguine with tomato, red onion, coriander and a balsamic dressing. Again an entree of whitebait fritters and the rest portioned off and in the freezer for another day. 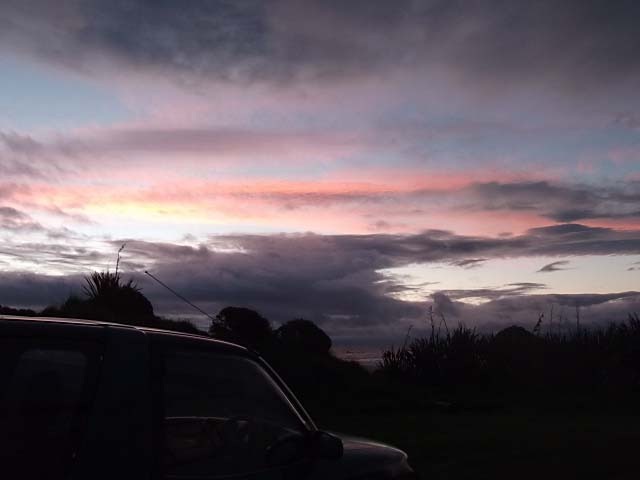 Time to head into Invercargill, as there is no phone or internet connection here and as it is the end of the month, it is time to get accounts sorted, bills paid and a general catch up.